Before going right into the city, we attempted a cache hidden close to a nearby underpass … we must have tried every exit from that *!? 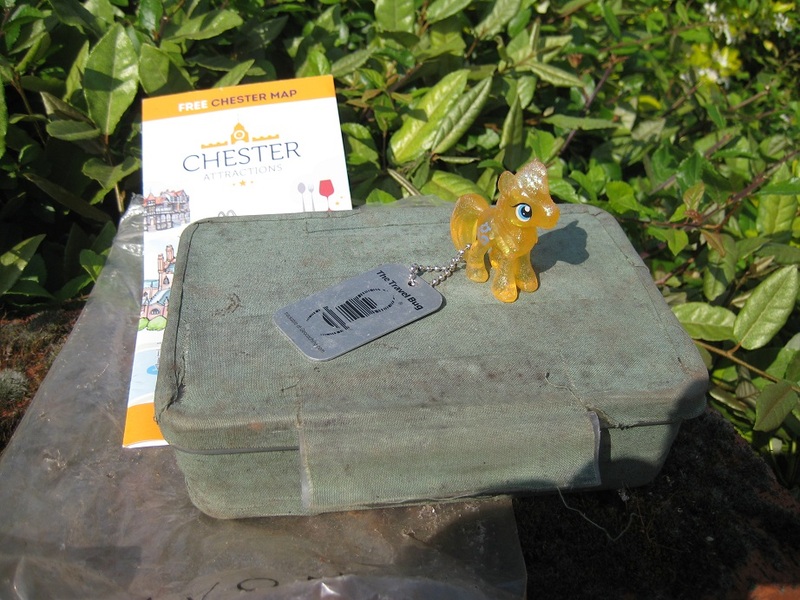 * underpass, and looked at a lot of brick walls and signs, but we eventually got ourselves into the right place, finding the cache and a trackable of a little horse, ‘Fearless Traveler’. 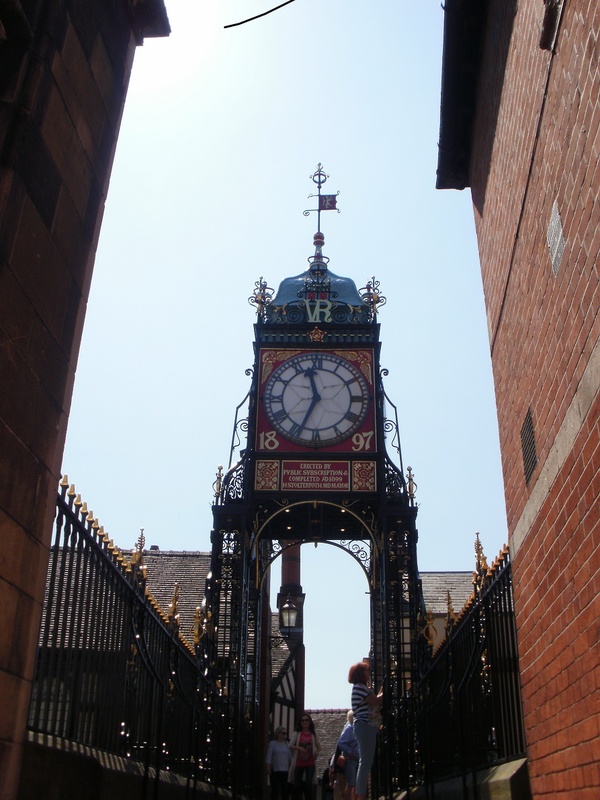 It was a short walk to Eastgate, close to the city centre, where the clock on the bridge over the gate is, so they say, the second most photographed clock in the world. There’s a cache here, too, though muggles swarm around the bridge, and you must pick your moment to find it. 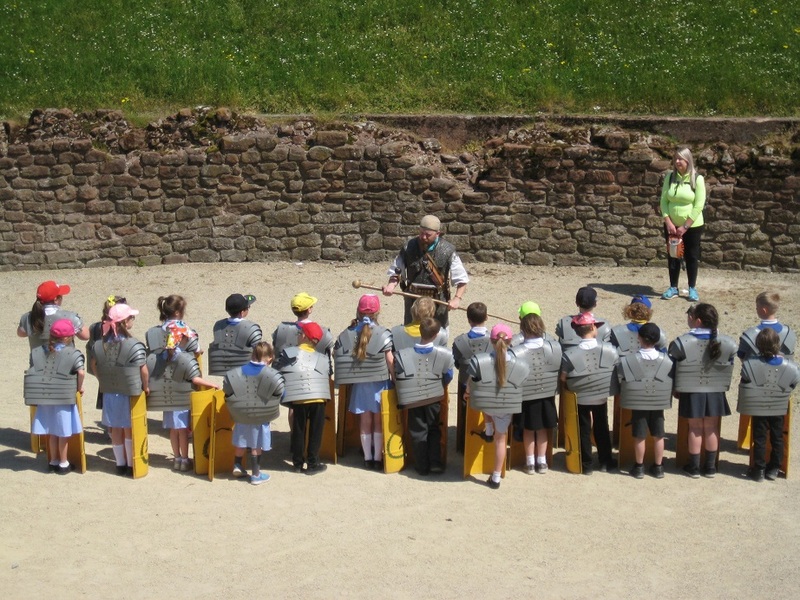 Further on round the walls we climbed down to pass the Roman amphitheatre, where a group of schoolchildren were being trained to be Roman soldiers and having lots of fun doing it, being ordered about with shields as large as they were. Having diverted from the park, we went further on and back into Grosvenor Park, where we’d had a cache DNF (did not find) two days before. We had a slightly amended set of cache coordinates, and we were hopeful. We approached, only to find a muggle asleep on the grass nearby. We retreated to eat our sandwiches and to watch a muggle carrying a large, opened bag of monkey nuts through the park. And we found some of those nuts wedged into the trees when we started our search (so THAT’s why the squirrels are so tame and brazen!) 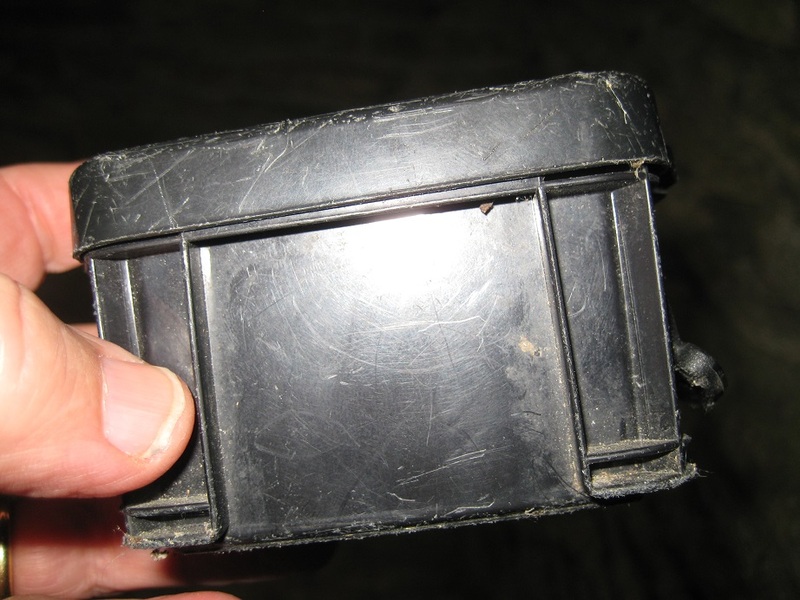 We looked around for a bit – we thought we’d searched here before the coordinates were changed – then a chance look down revealed the cache lying on its own in the open, in a small dent in the dirt. We signed the log and tried to replace it as the hint said it should be. Good to find one of our earlier failures. 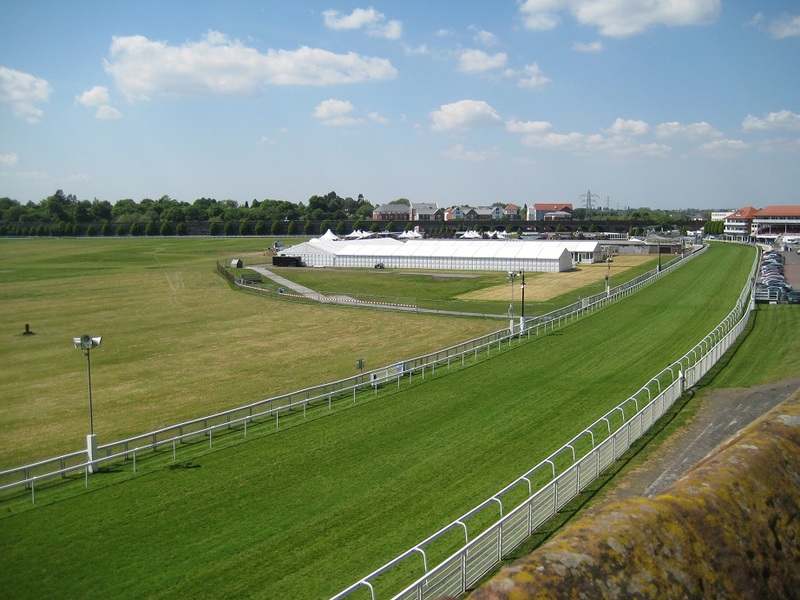 We returned to the southern section of the walls, overlooking the River Dee, then around the corner to the western walls, overlooking Chester racecourse, the Roodee. http://www.d2architects.co.uk/a-brief-history-of-chester-racecourse-730.html It’s the oldest racecourse in England, and one of the smallest, tightest circuits, with one lap being just over a mile, but this means that you get a good view of the whole of each race from either the grandstands or the walls. 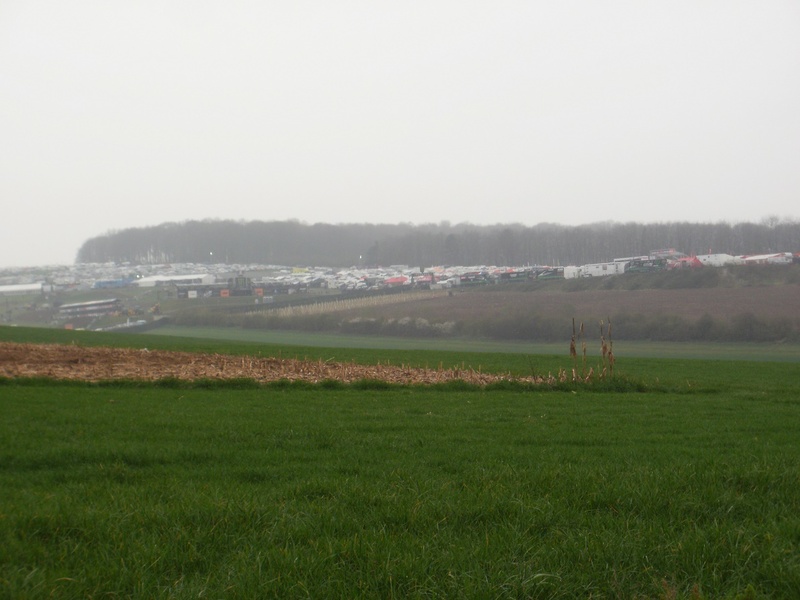 The course was being prepared for a race meeting the next weekend, and it was quite busy even then: it must be heaving on race day itself! There are a couple of caches along this section, too, and it was again a struggle to find the caches and sign the logs without attracting the attention of the many passers-by. We arrived back at Northgate with our wall walk completed. But we still had another mission to complete … we had started on two multicaches on our previous visit, but had failed to finish either. 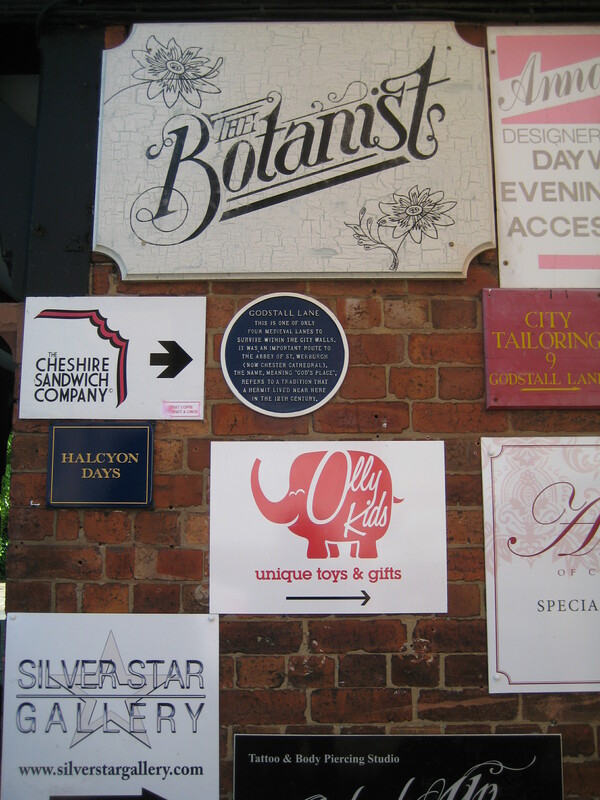 Each had multiple stages: one involved looking up at various items above head height around the old city, and the other required us to glean information from some of the many blue plaques dotted around. So far so good: we reviewed what we had done two days before, then went off to complete the rest. We checked our answers, but we STILL hadn’t finished them. Grrr! We’d got our looking up confused with our plaques and had missed things. We sighed, and set off on another couple of laps of the city, to check all the clues again, some for the third/fourth time. I was getting a bit fed up by now. Eventually we had some answers and set off for the allotted locations. 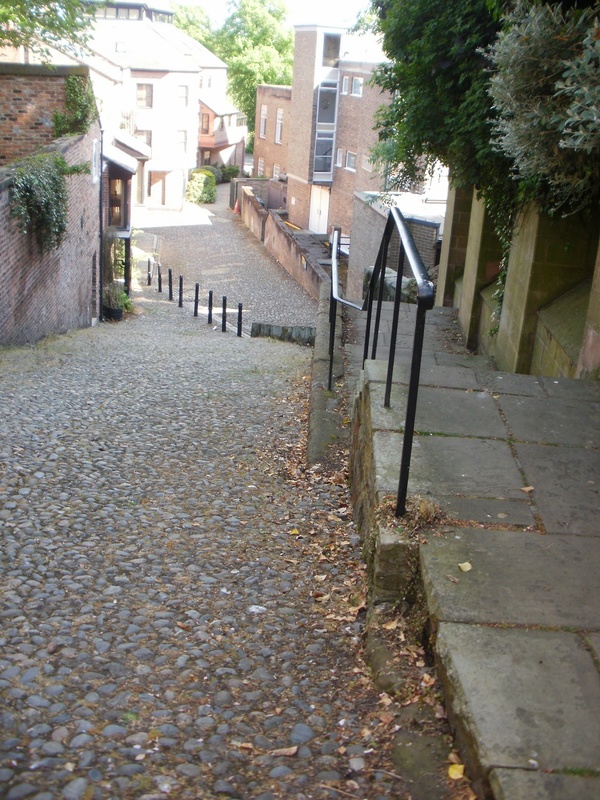 We thought we’d walked along every single street in the city centre but we found two we hadn’t tried, one in a pleasant residential street, and one in a less salubrious service area behind shops. Phew! We were finished for the day. We returned to the swanky new bus station and went off for a rest and a meal. 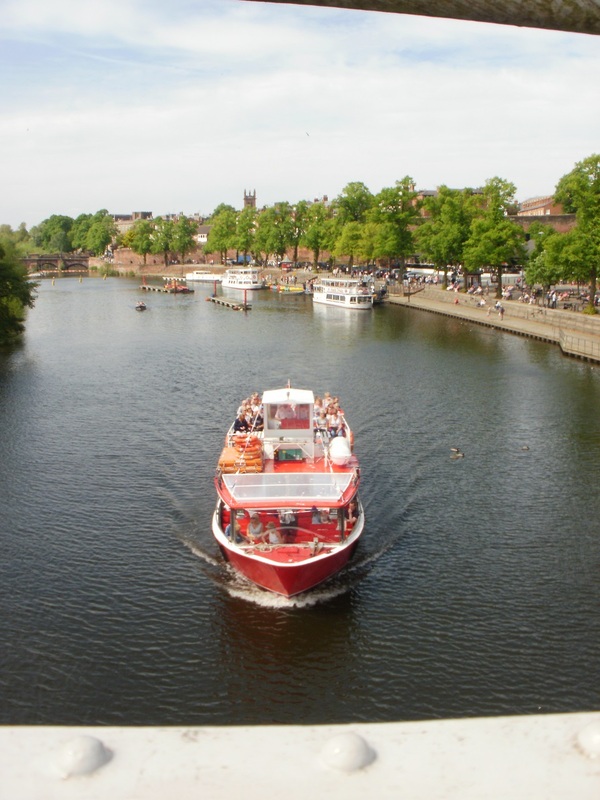 We had booked a week’s holiday in Chester, as it was an area neither of knew that well, and it would give us a small break from caching the Sandhurst Trail. 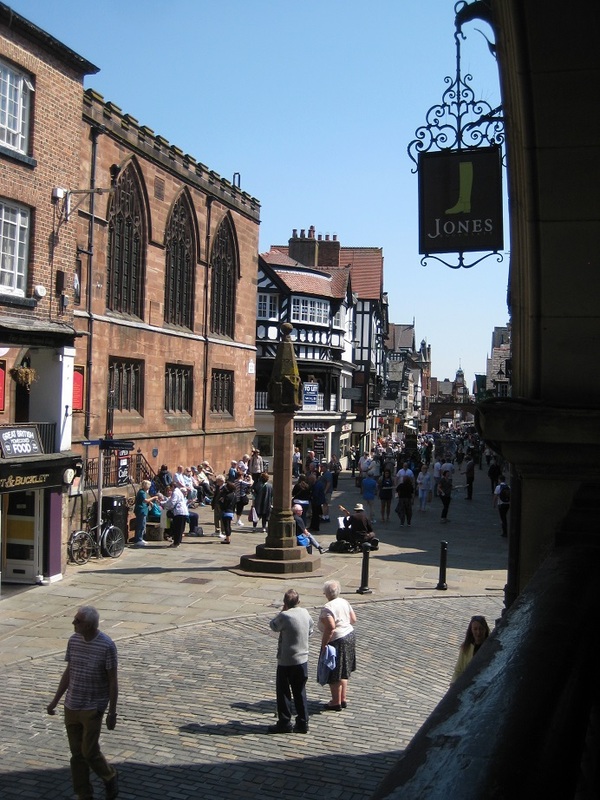 Our hotel was about 2 miles outside the City of Chester, and with a station on our doorstep, we took the train. 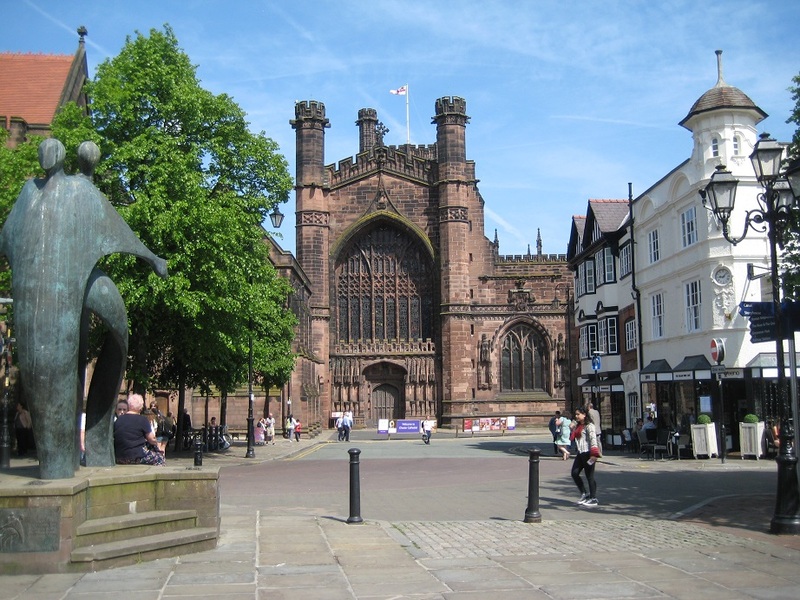 (Saved car parking fees, but didn’t save shoe leather as we later discovered Chester Station was a little distance from our City Centre Caching Targets). 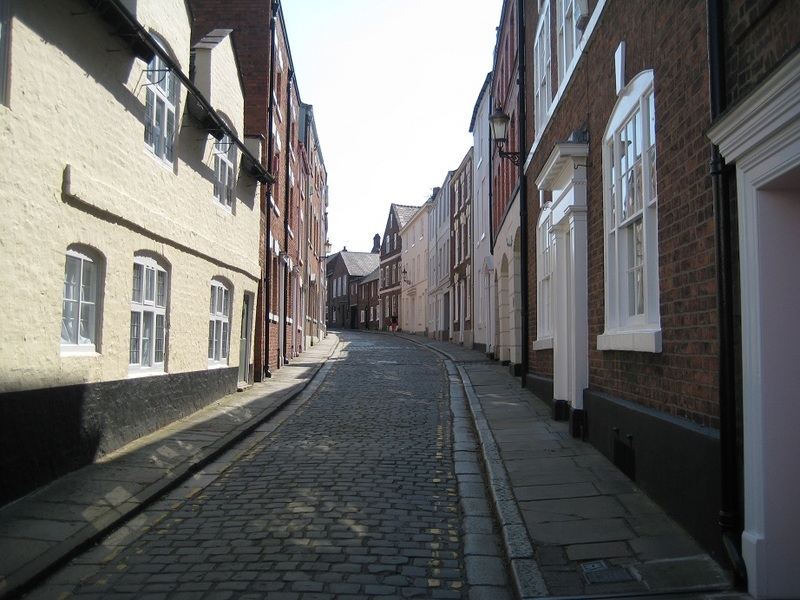 Chester is a former Roman Town, with a 2 mile Roman Wall surrounding the city centre. 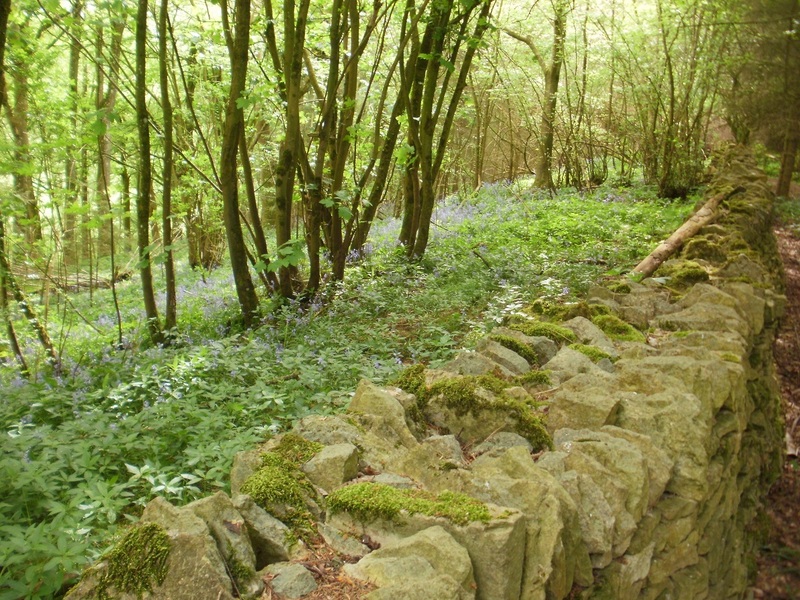 (The wall has been rebuilt several times since the Romans left!). The station was to the North of these walls, and our target caches was well to the South of the Walls, near the River Dee. 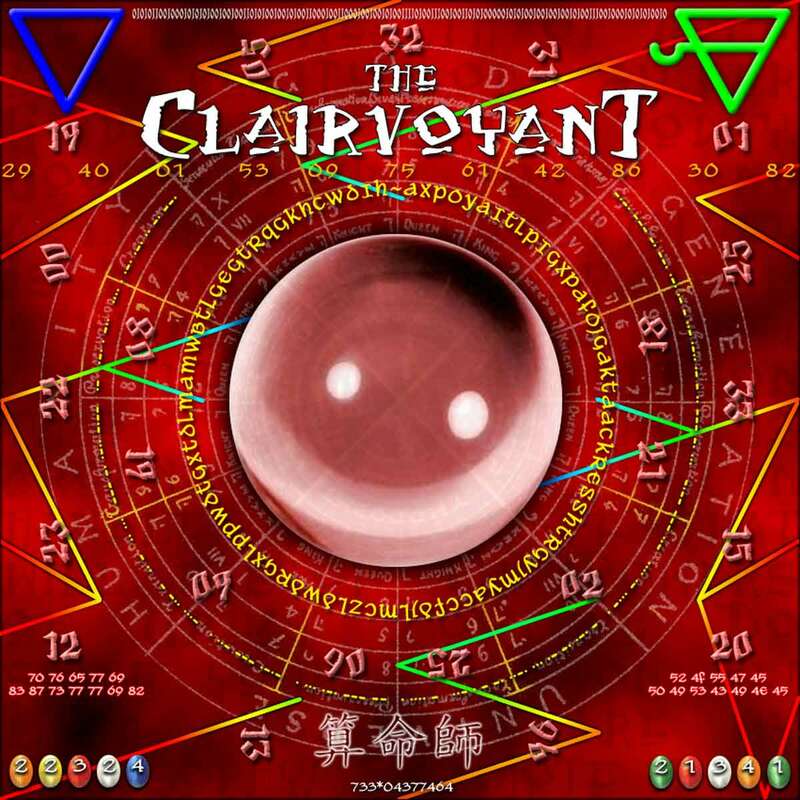 Before we left home we had solved a difficulty 5 puzzle cache called “The Clairvoyant” and we were determined to find it. 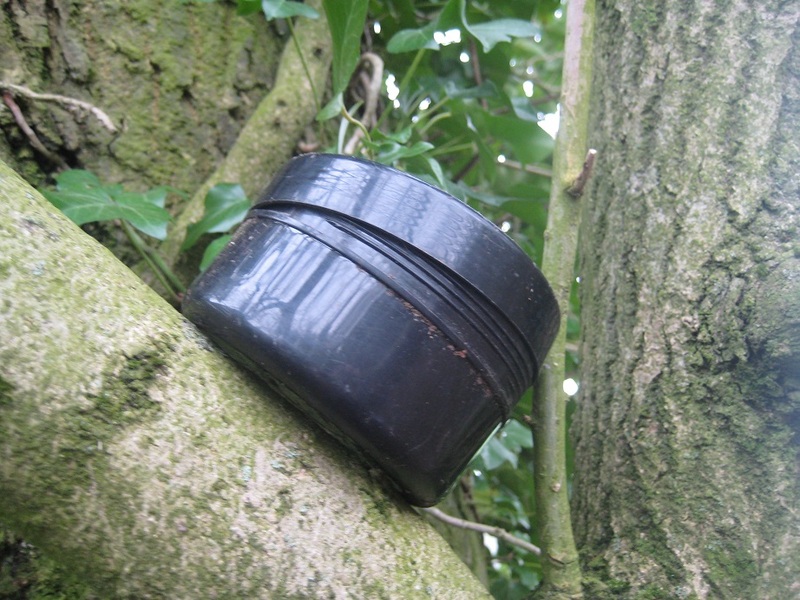 As its location was some distance from the station, this gave us a chance to find caches on the way. Can you look into the future and solve this puzzle, before you read whether we discovered the cache ? We had forgotten that city locations play havoc with the GPS ! Many times we found a cache about 20 feet from its location. 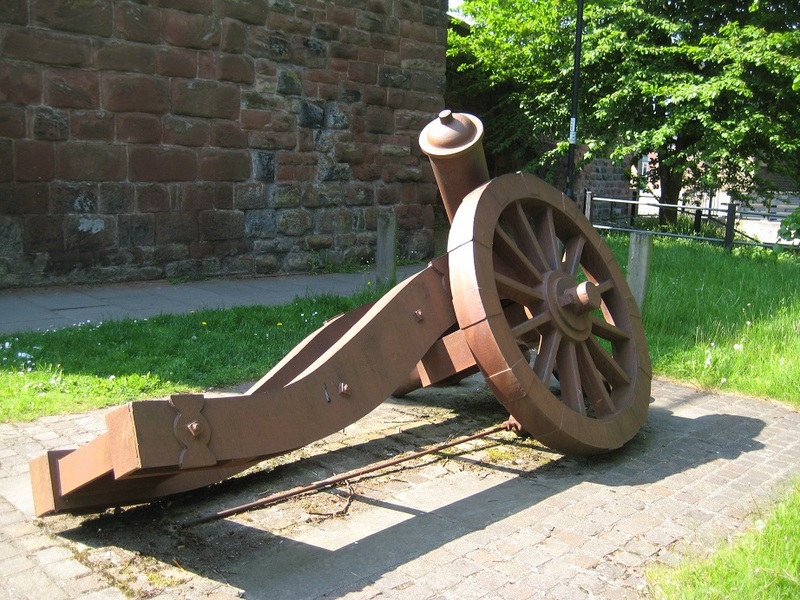 The first was attached to some ‘street furniture’ near to the Deva pub (‘Deva’ being the Roman name for Chester). We weren’t so lucky looking for a cache in Grosvenor Park called ‘Park Life’ as we found neither the cache nor the ‘Stump’ alluded to in the clue. 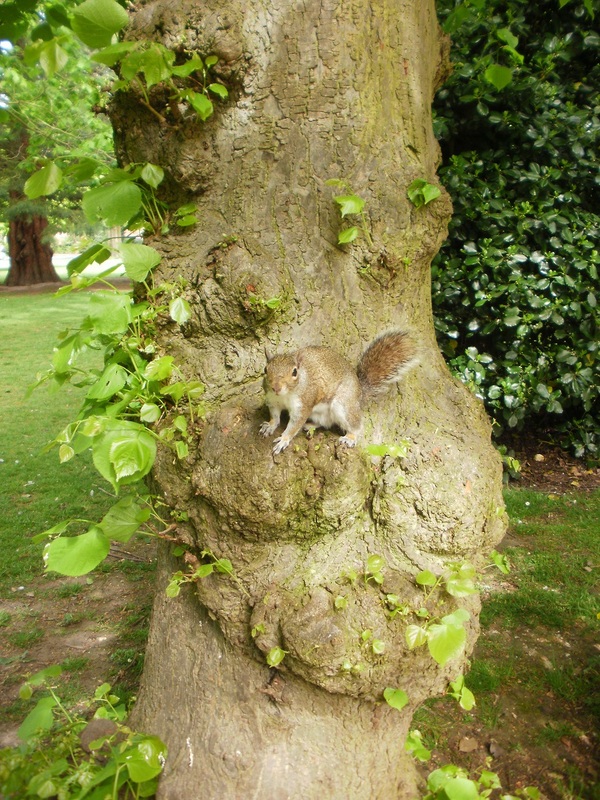 We were in a park were squirrels abounded, sadly they didn’t help us. 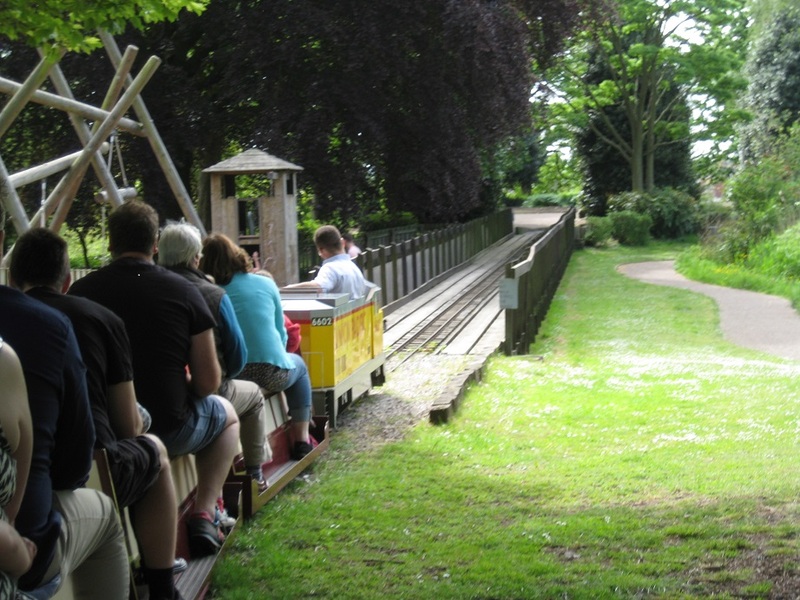 We even took a ride on the model railway and looked again. Nothing! 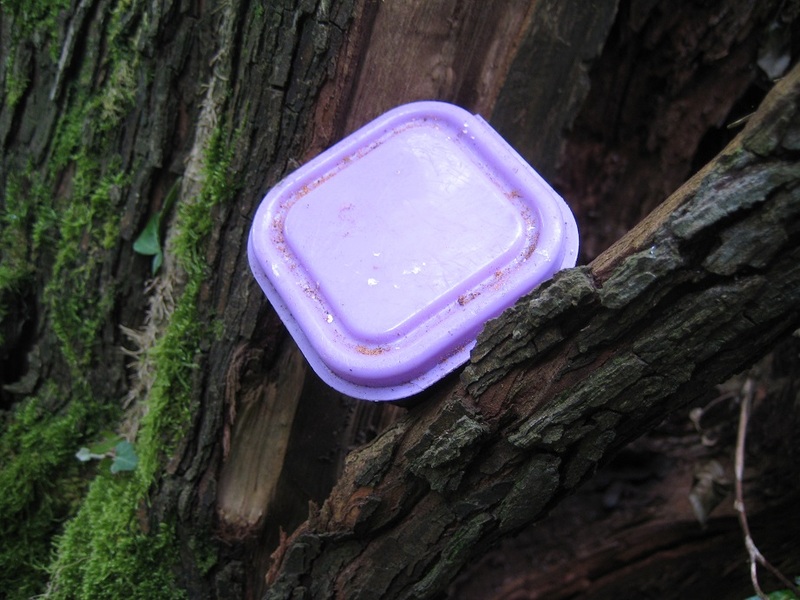 We did find the other cache in the park, “A Walk in the Park”, and as we sat and completed the logging, a young couple sat on adjacent seat, and fed another squirrel… with a very large chip! To see a squirrel holding and nibbling a chip lengthways (as if a corn-cob) was really cute and funny! 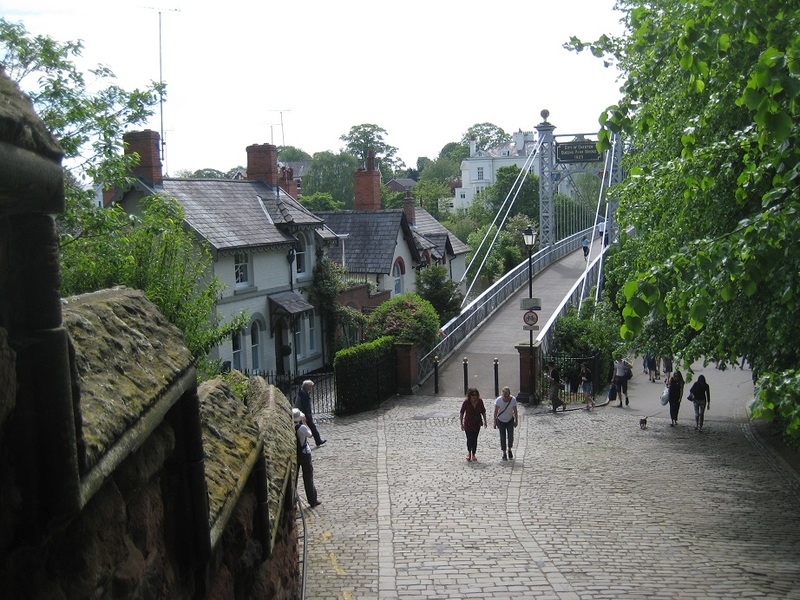 We needed to cross the river, and the Queens Park Suspension Bridge (originally built in 1852, and rebuilt/restored a few times since) provided us with our next cache. 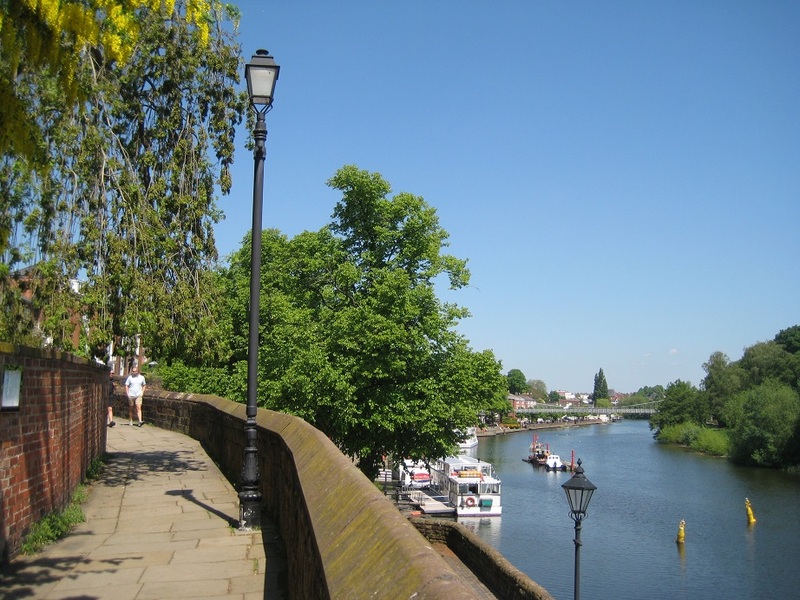 We had a half-mile walk along the River Dee’s Bank to “The Clairvoyant”. 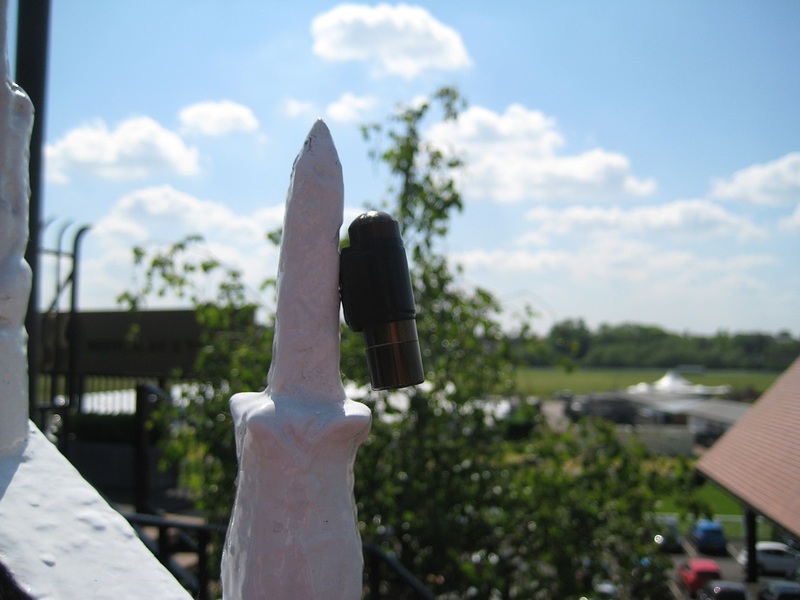 Like many puzzle caches, the answer is very obvious when you discover it. Here, a read of the previous finder’s logs, as well as fully understanding every word written about the cache, gave us the solution. 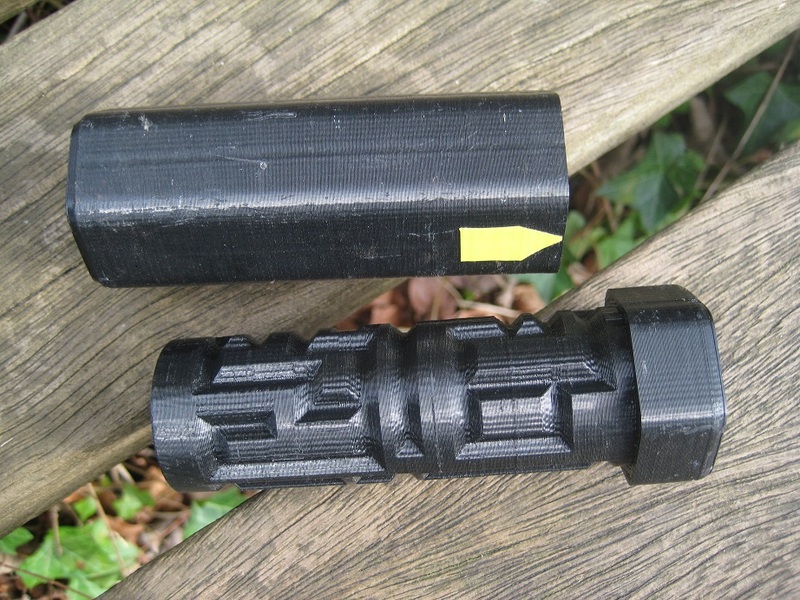 (Hint: to solve it will require printing it out, and using at least one tool). A small, indistinct trail led through knee-high nettles at Clairvoyant’s GZ. 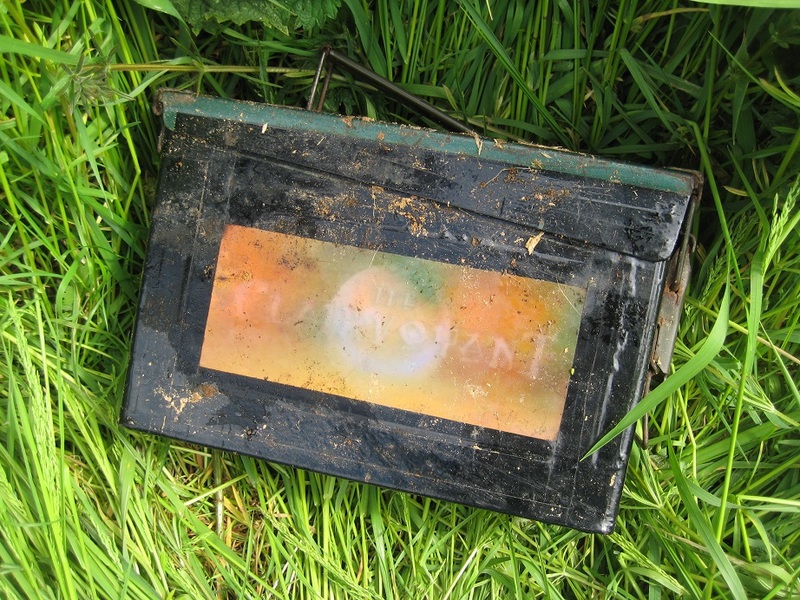 An even smaller track lead to a bush which provided excellent camouflage for an ammo can! 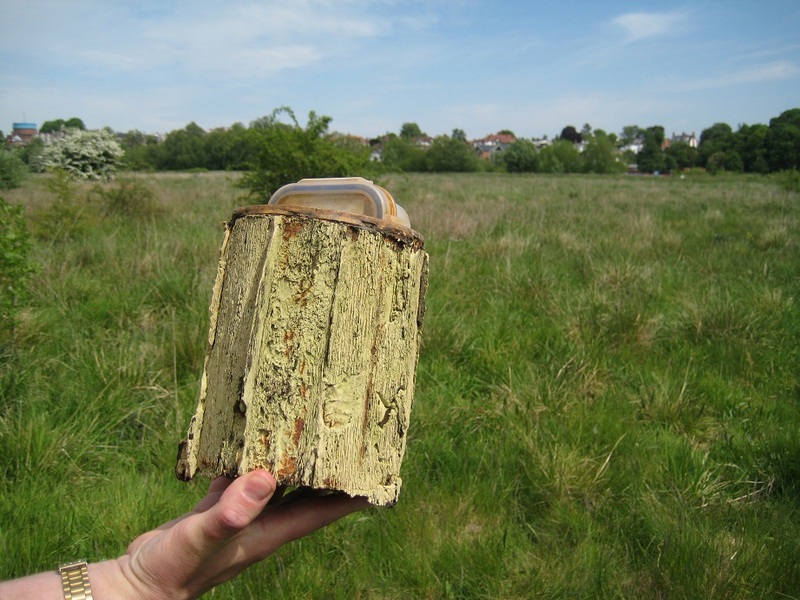 It is certainly worthwhile to find a large cache when a large amount of brain-power has been used! The flood-plains near the River Dee provided an excellent vantage position for watching a canoe race take place, as well locating one other cache in a very disguised paint tin! 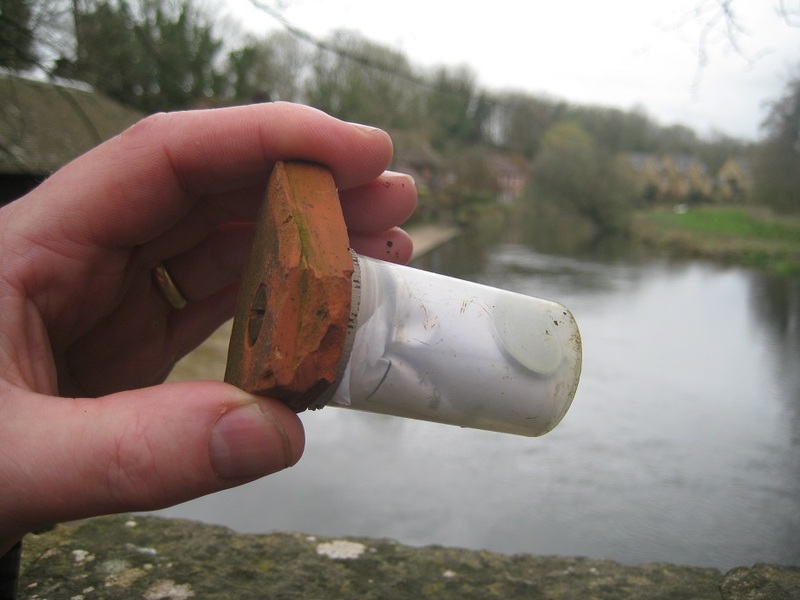 We headed back towards the City, collecting another, much smaller cache, near the former City Mill. 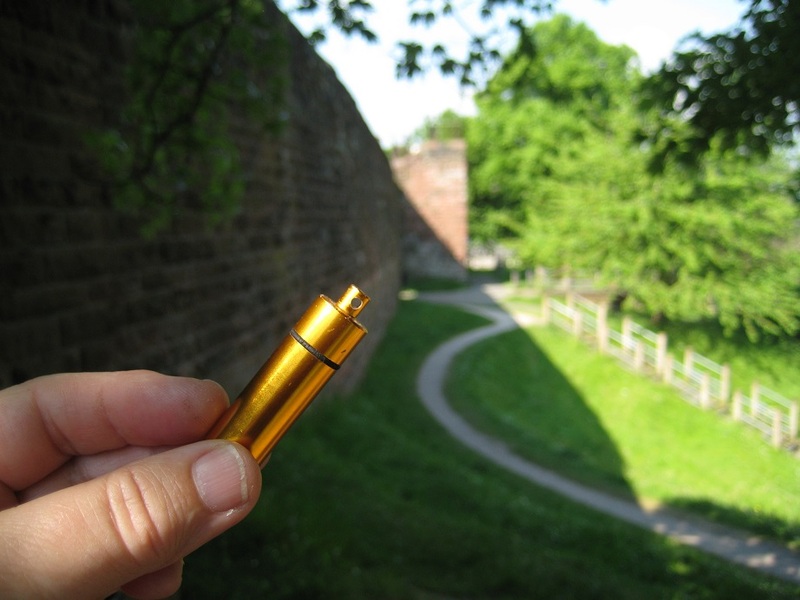 The centre of Chester (ie inside the city walls), has a good mixture of caches. 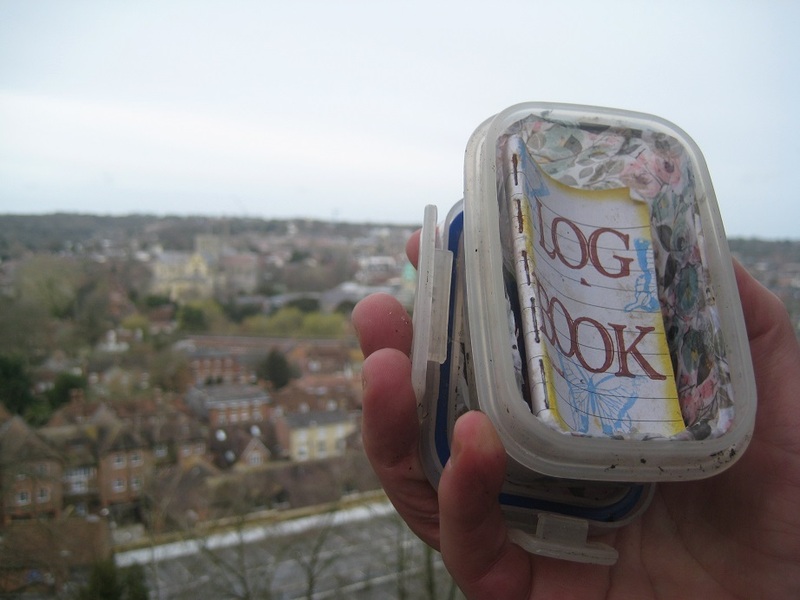 Some standard, easy to find caches; an earthcache based on the former Roman Baths (successfully answered); and two very lengthy multi-caches. It was these multicaches we started work on, as we headed back towards the Station. 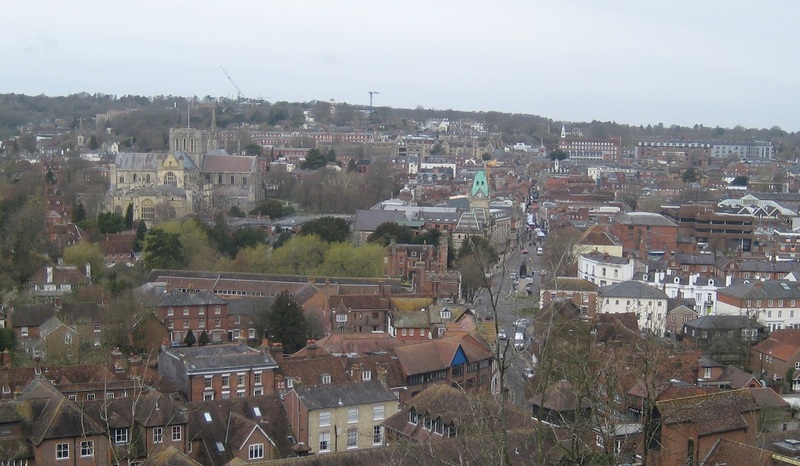 We realised we didn’t have enough time in one day to complete all the stages, so we stopped about half-way in each, to give us enough stages to make a worthwhile return visit to the City. 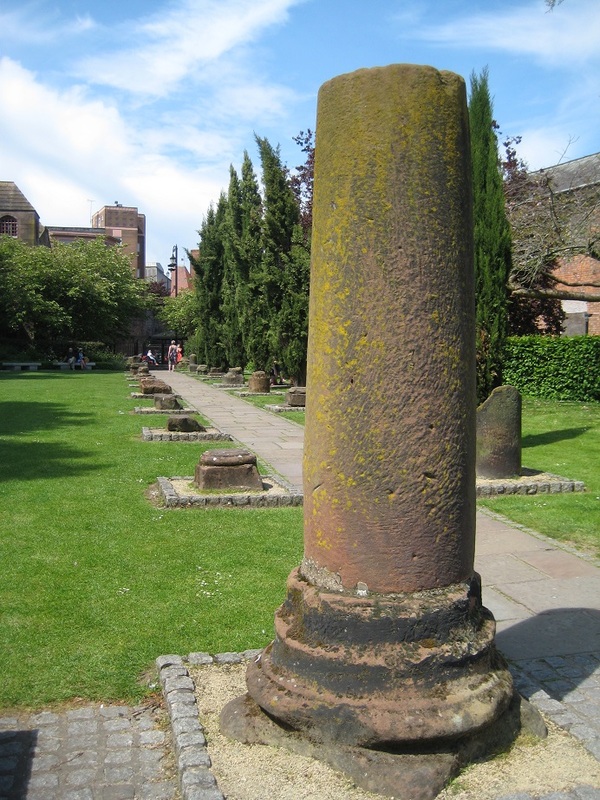 The day was hot, and after several hours wandering around we were tired, so we thought the Chester Cathedral Multicache would give us a chance to relax and cool off. 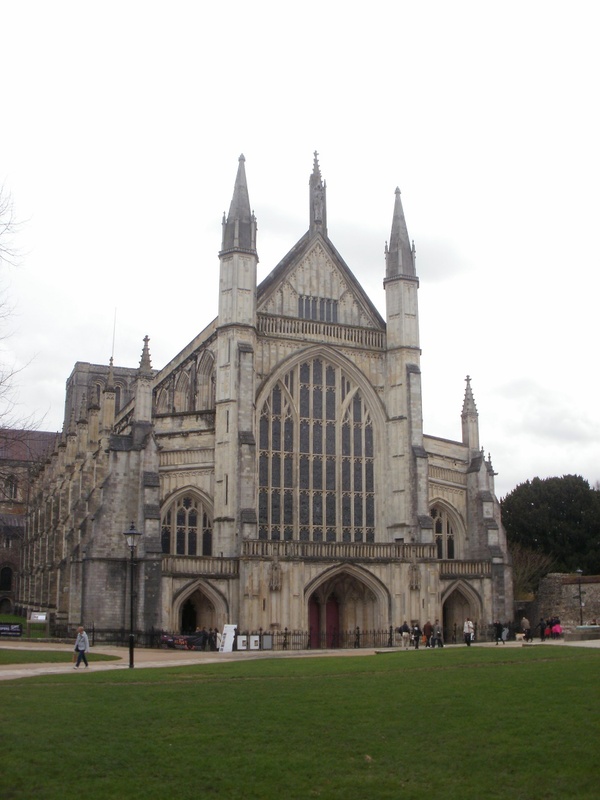 We unfortunately arrived at the Cathedral 20 minutes before the Annual Mayor-Making service was due to start. Seats were named, various several members of the clergy were due to participate, hundreds of guests invited… and we had 20 minutes to find 4 objects and dates to yield the final co-ordinates for the cache. So much for a relaxing few minutes! Fortunately two of the answers were found in a small courtyard adjacent to the Cathedral so we were well away from the pomp and ceremony as it unfolded. 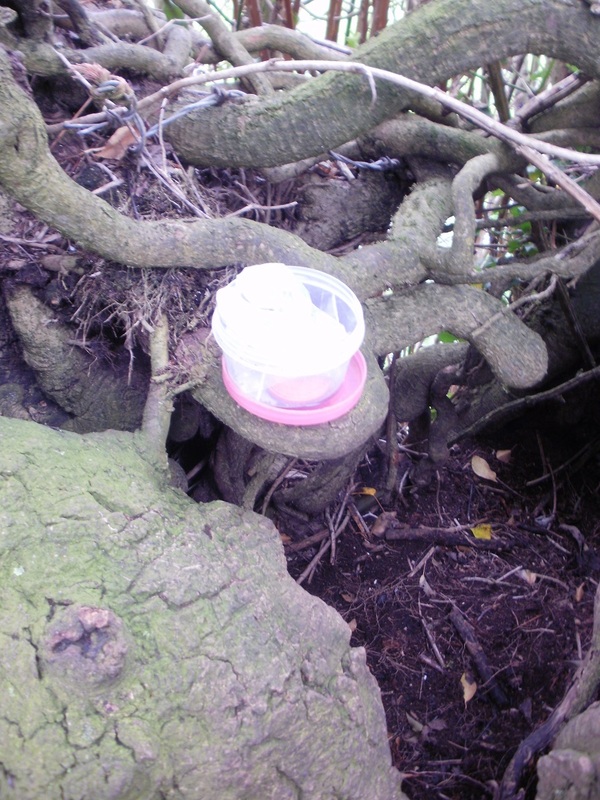 Then we had to find the cache! For some obscure reason (probably because all the photos on http://www.geocaching.com were of a water feature), we thought the cache was nearby. Indeed it was – 30 feet away. 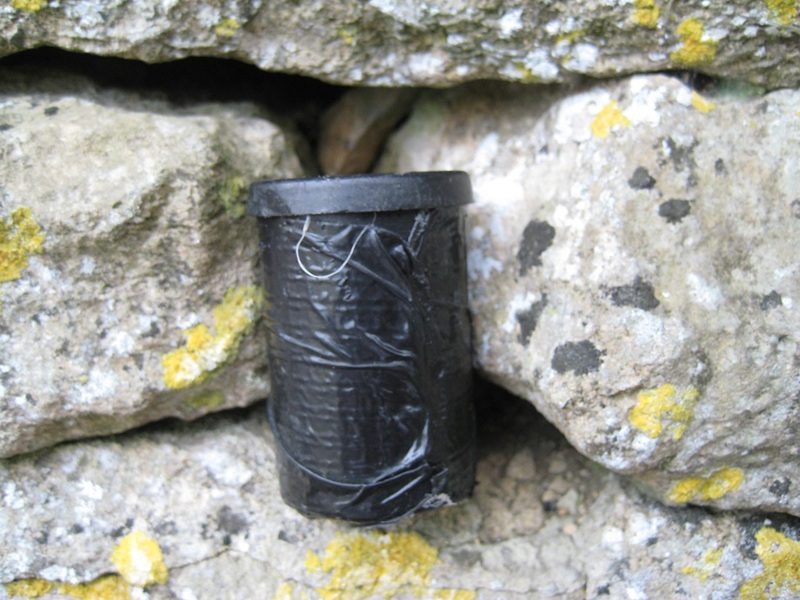 But, after far too long searching inside the courtyard we concluded (with the help of the gift shop staff – who knew where the cache was) the cache was outside the courtyard walls! 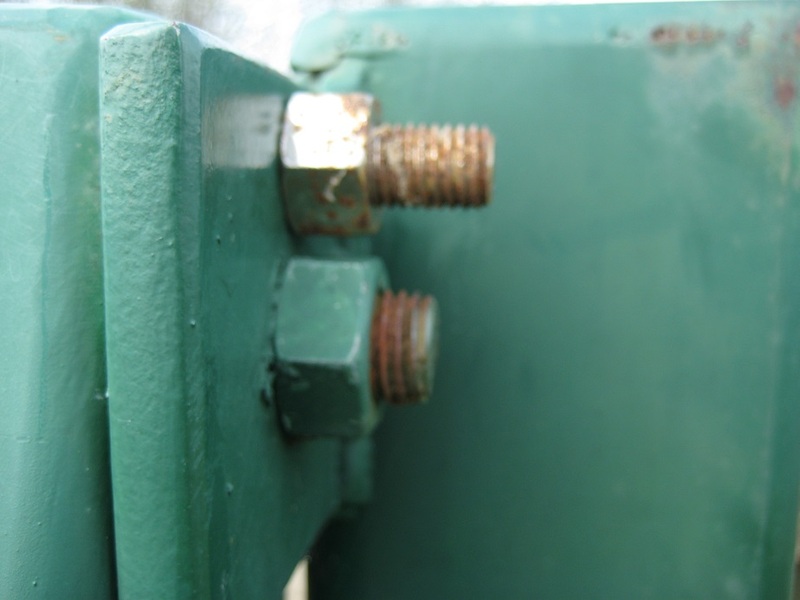 Once at GZ… we found a container LOCKED to some gates. The numbers we had found formed the number to UNLOCK to cache! 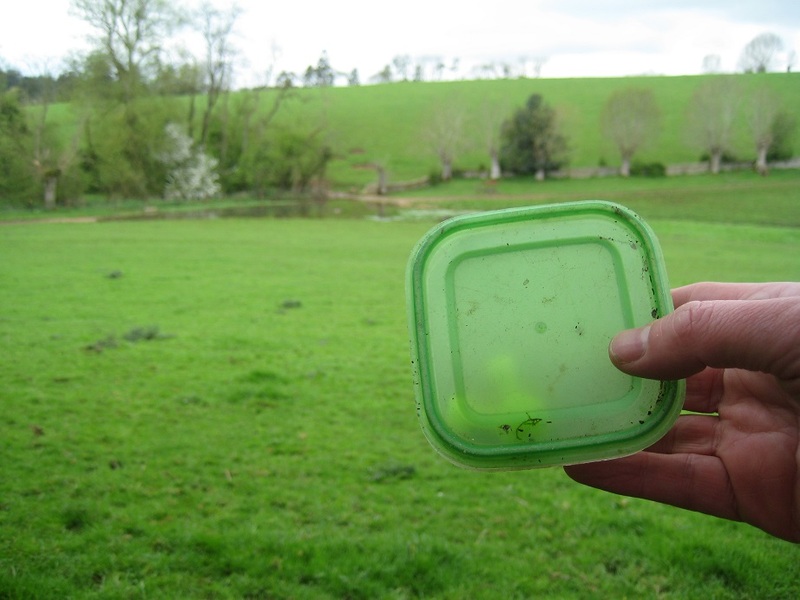 The cache was in a relatively high muggle area.. but will never be lost! 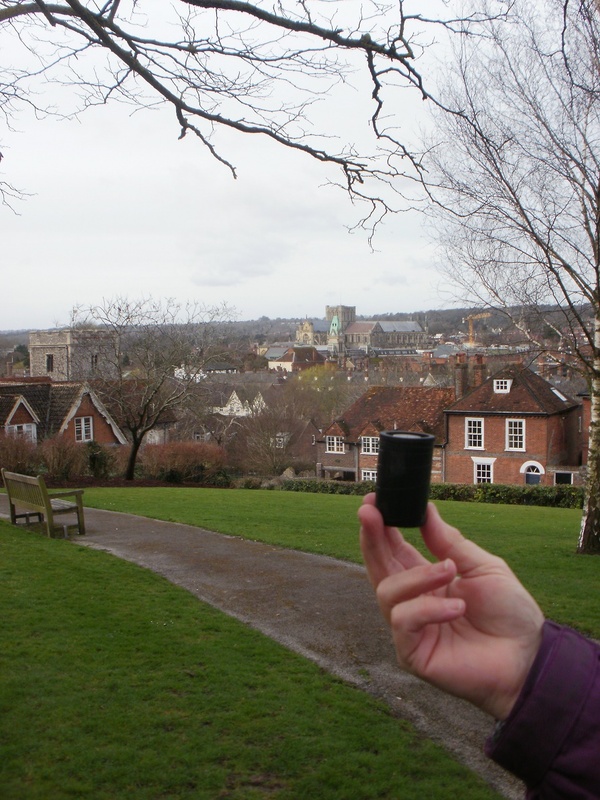 Our last cache of the day was close to one of the towers that are situated on the City Walls. 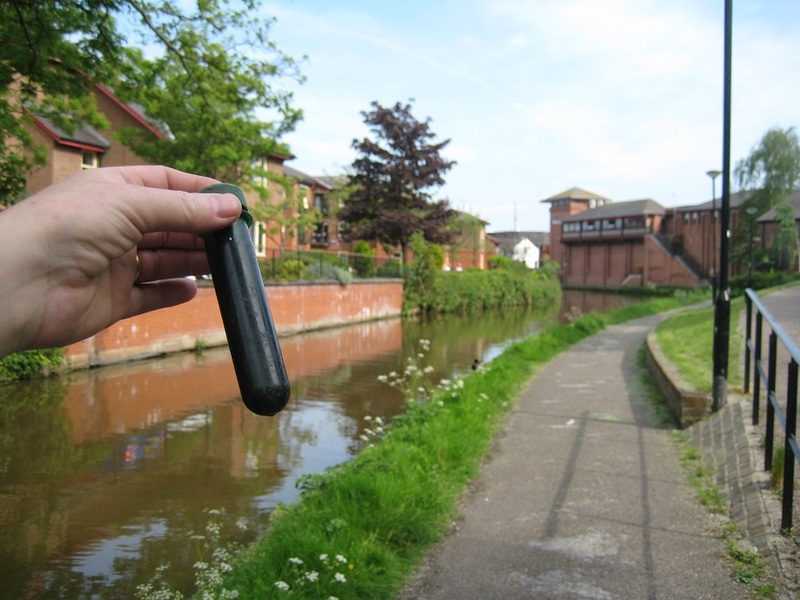 An easy find, and in a lovely location with Roman Walls above, and the Shropshire Union Canal nearby. 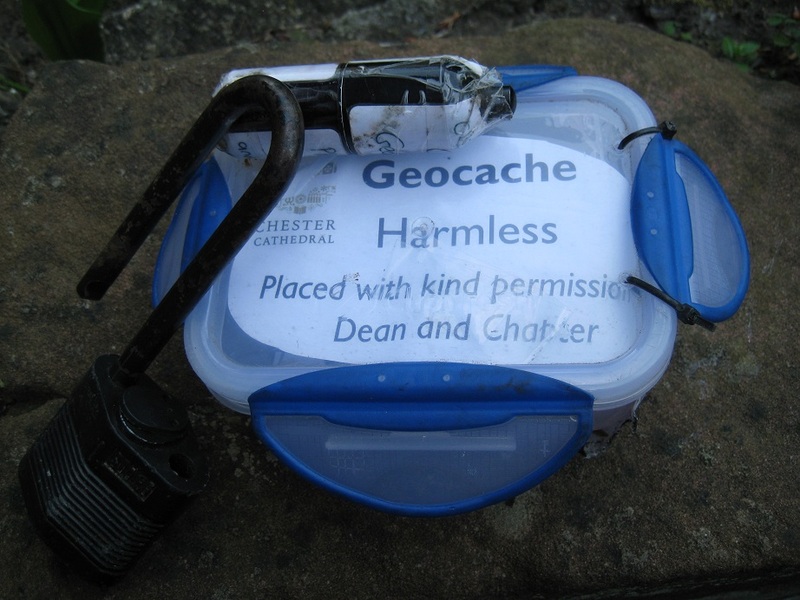 We had walked about 6 miles, found 9 caches (including an Earthcache) on our first sortie into Chester. 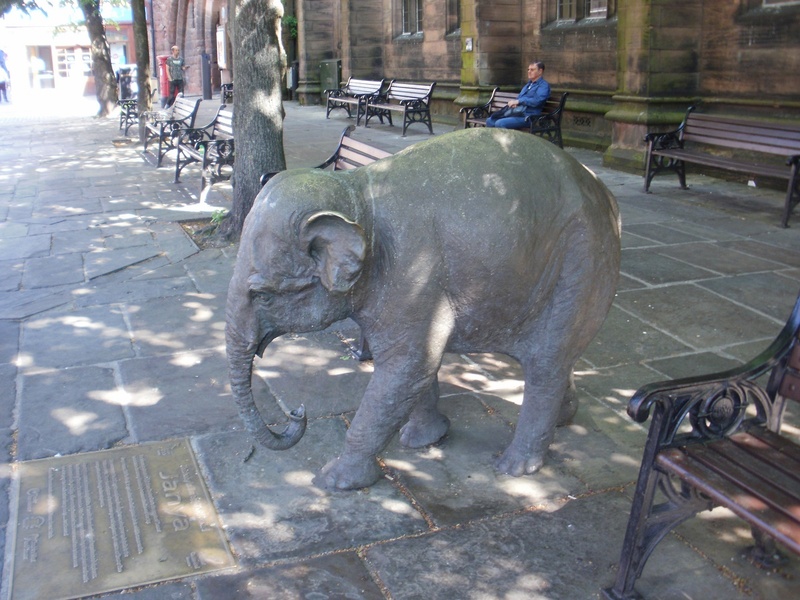 We still had lots more find … watch out Chester…we’ll be back! 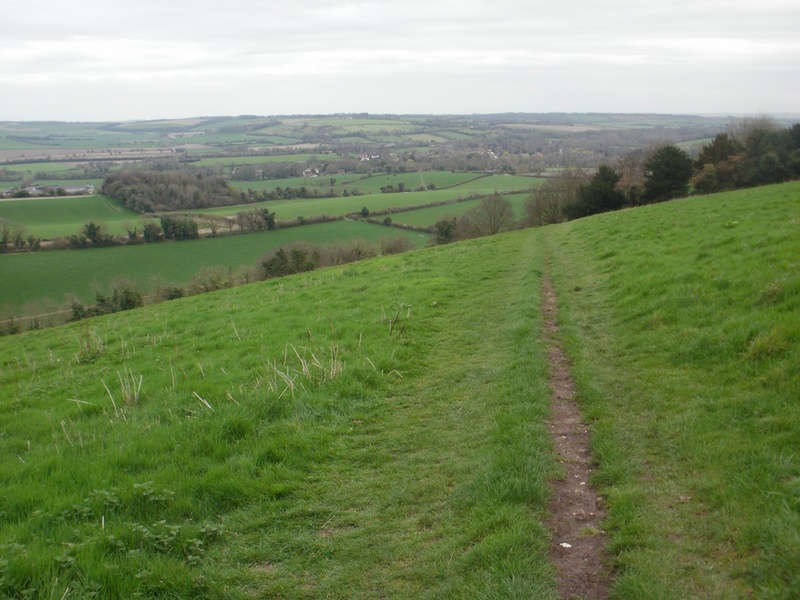 Spring was two weeks further advanced, and we were set to do the next section of our epic walk from Sandhurst (Gloucestershire) home to Sandhurst (Berkshire). 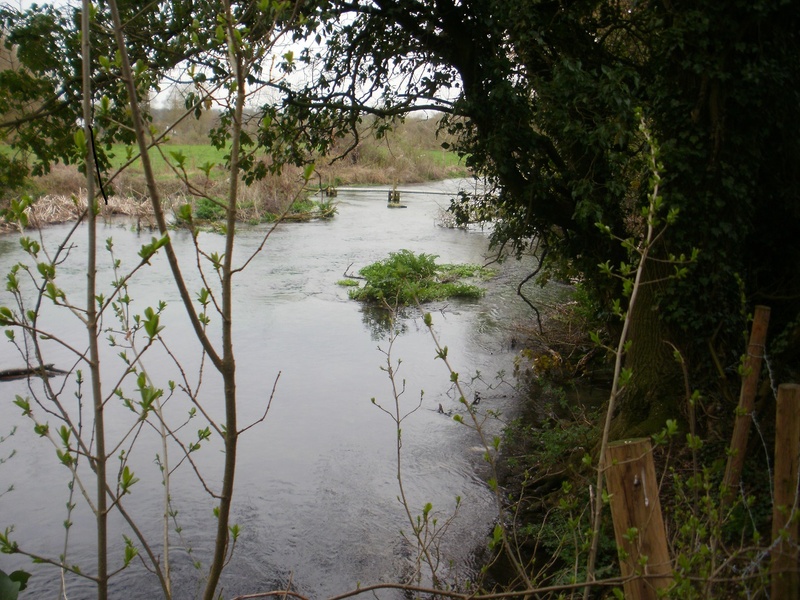 This section followed the Coln valley downstream from Bibury to Fairford. 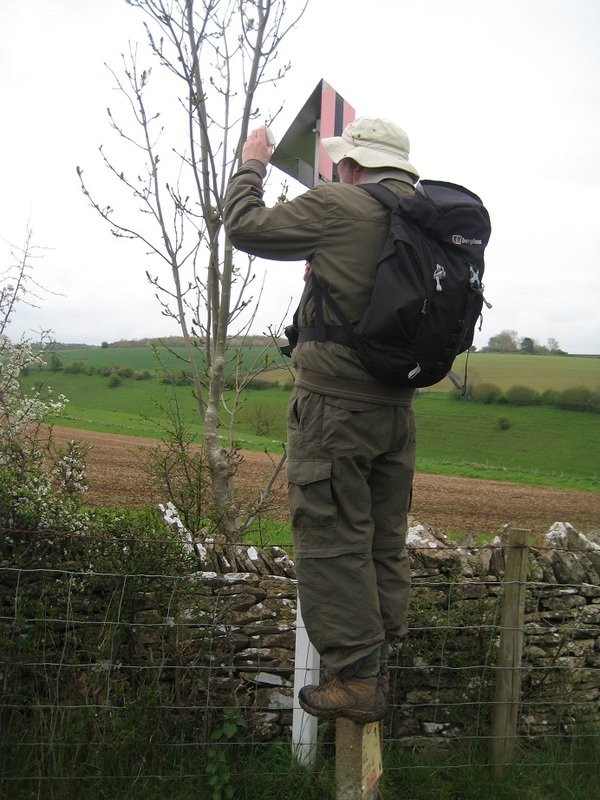 And, good for our navigation, the route also followed more of the largest cache series we have ever seen (the Great Cotswold Walk or GCW series) which comprises over 130 caches. Just follow the arrow on the GPS! 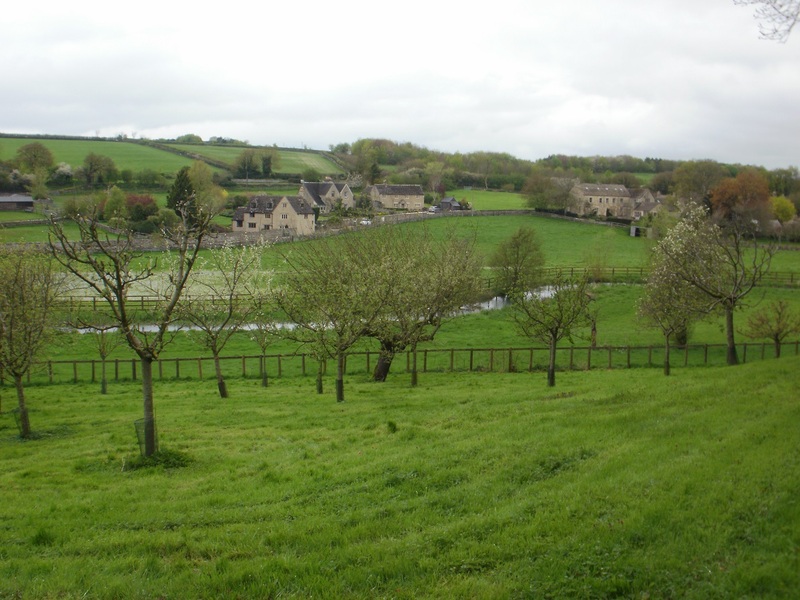 We set off from the riverside overlooking Arlington Row in Bibury, where we finished our last walk. It was early on a weekday morning, but the tourists were already out in numbers. Luckily, they were all clustered around that one small area, and we were soon away from people as we stepped onto the track leading away from the village. 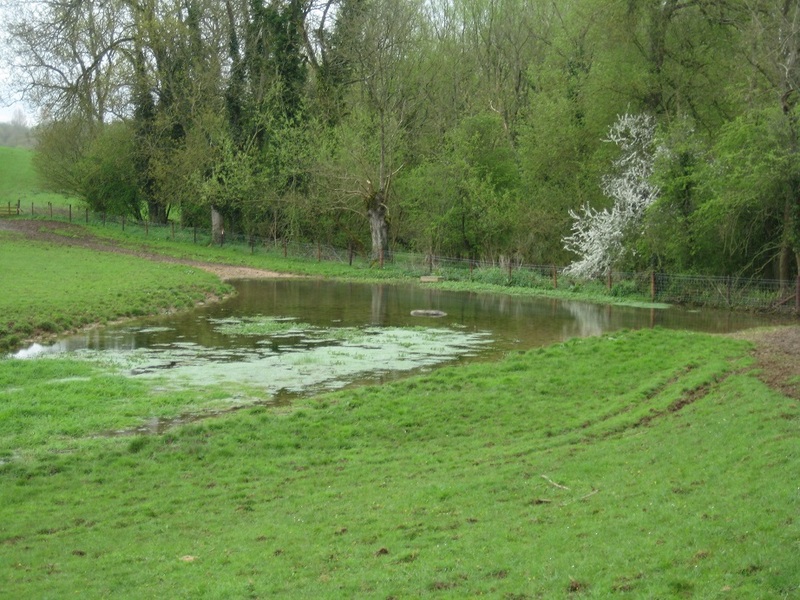 It was about 3 miles to the next village, Quenington, walking roughly parallel to the river, along paths and tracks, through fields and woods, all very attractive and spring-like. 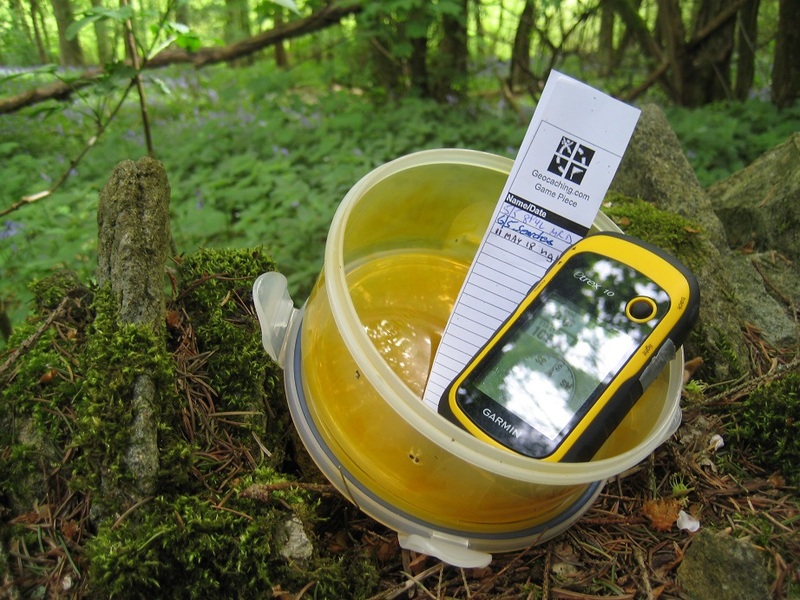 By then we had found just under 20 caches, almost all of them from the GCW series, and all straightforward finds with accurate hints to assist our searches. 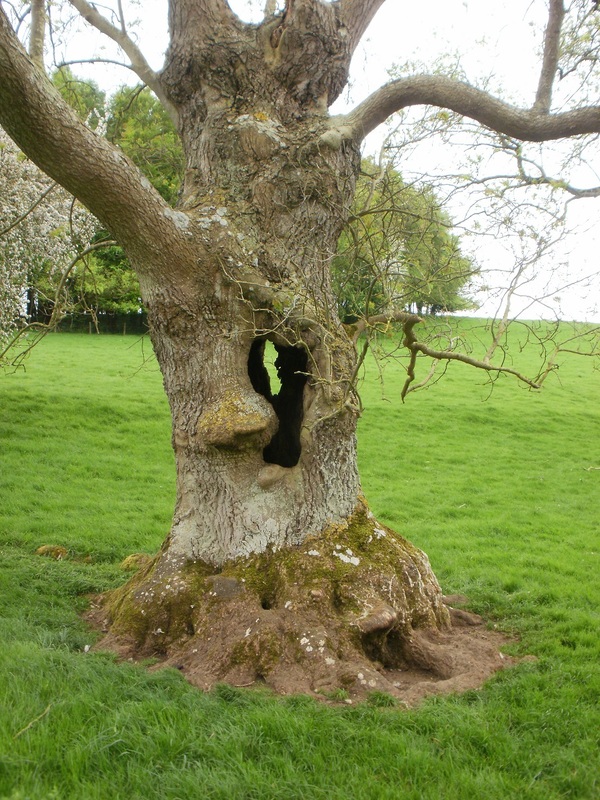 One of the caches not in the GCW series was Old Ent, a cache set in a venerable hollow tree close to the footpath. We sort of expected the cache to be hidden in the hollow trunk of the tree, but no … a search ensued and we were eventually successful. 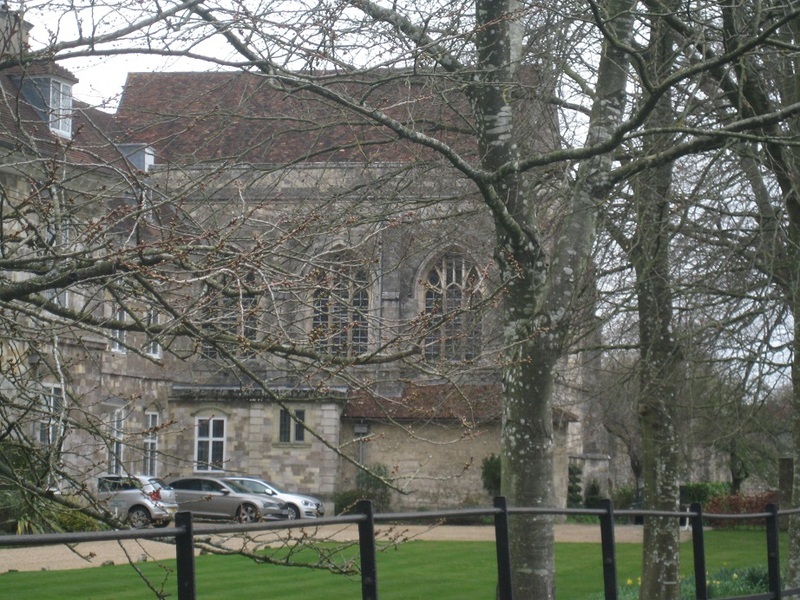 Our arrival in Quenington coincided with lunchtime, and we sat on one of the many seats on the village green, ate our sandwiches, and watched the world go by. 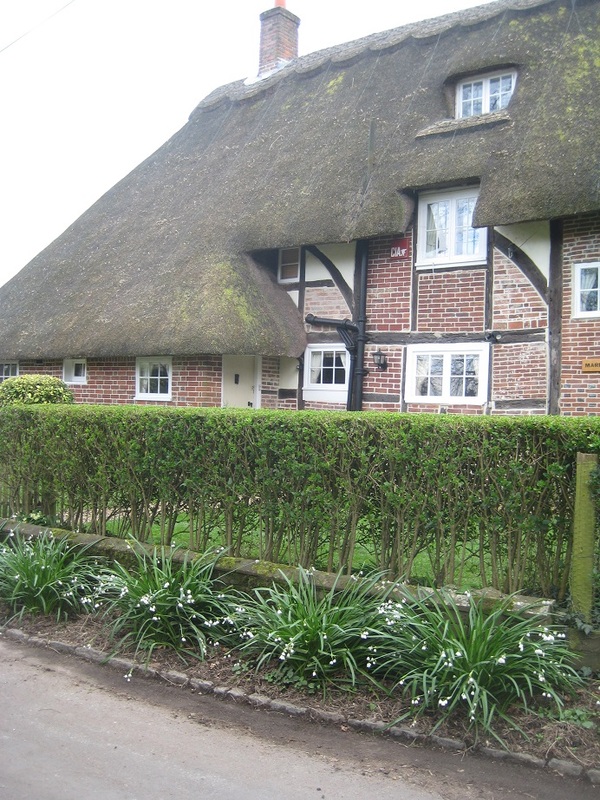 The green was freshly mown and all was very tidy: it was the village fete the very next day. 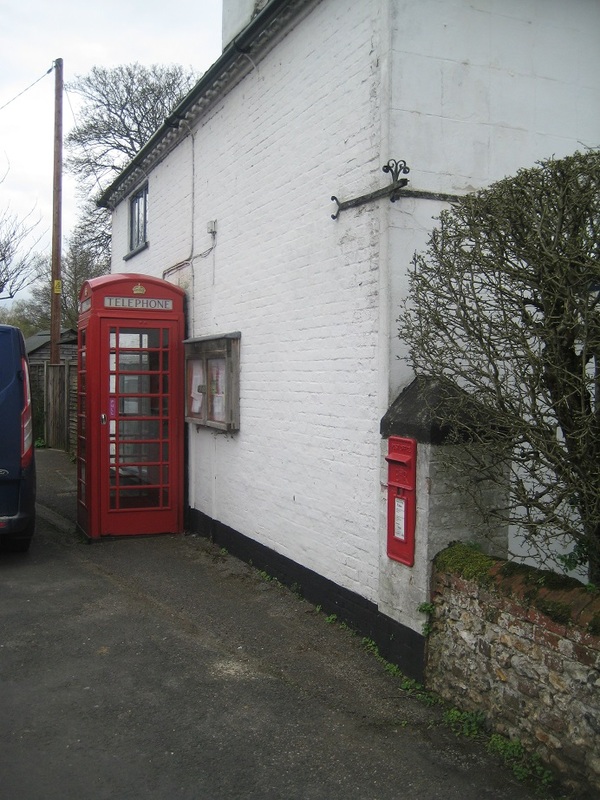 There were two multicaches in the village: one from the Fine Pair series (where a red telephone box is visible from a post box), and another from the Church Micro series, St. Swithin’s Church https://www.britainexpress.com/attractions.htm?attraction=1565. 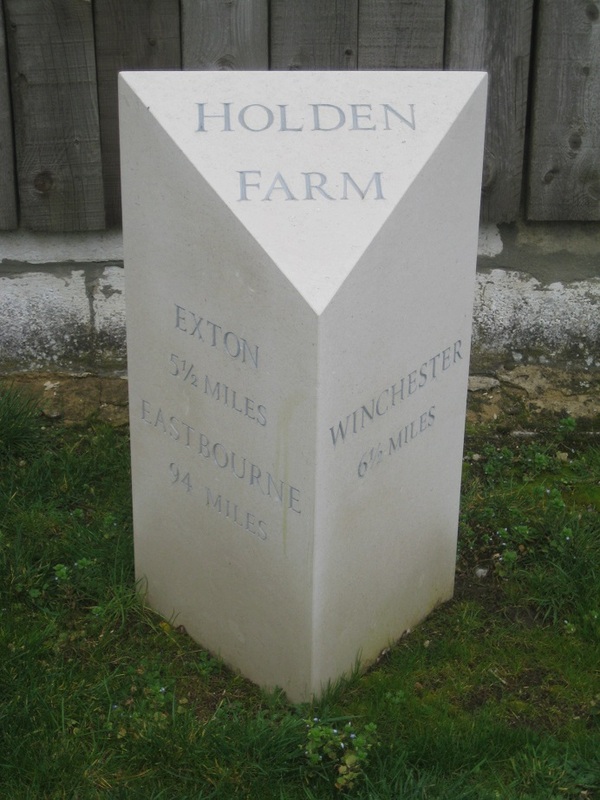 We found them both, criss-crossing the village and the village green several times on the way. 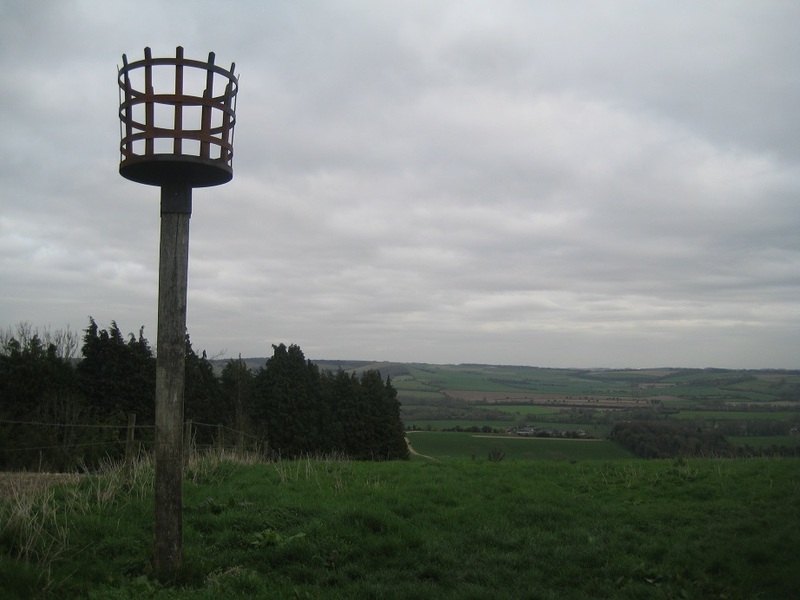 Eventually we decided we had ‘done’ the caches of Quenington, striking out towards Fairford. 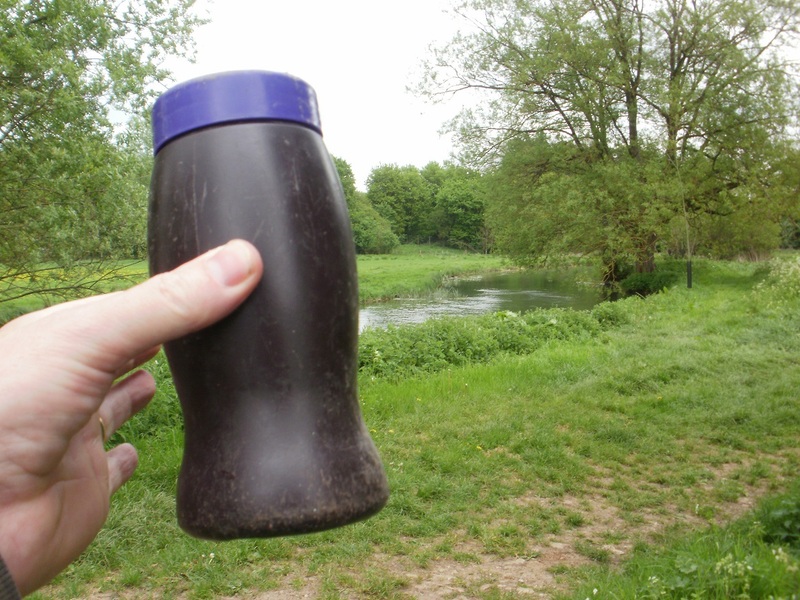 We trundled onwards by the river, finding yet more caches as we went. 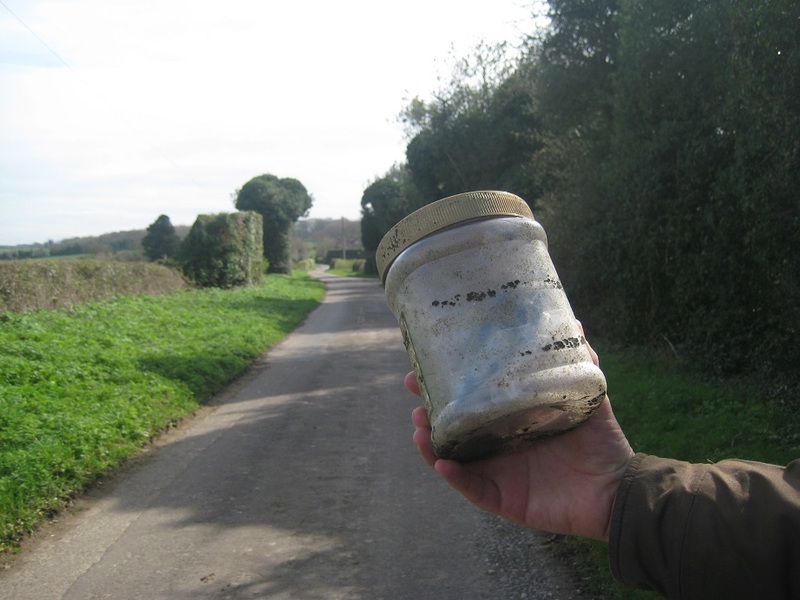 While finding one cache in the woods, we were passed by a fisherman, who wanted to know what we were doing; a long explanation was provided by Mr Hg137. Later, having just found a cache, we were passed by a lone walker. We stopped to chat about inconsequential things, then both moved on. Strange that he also had a GPS … We looked back, to see the lone walker disappearing into the same hedge that we had just left. Aha! 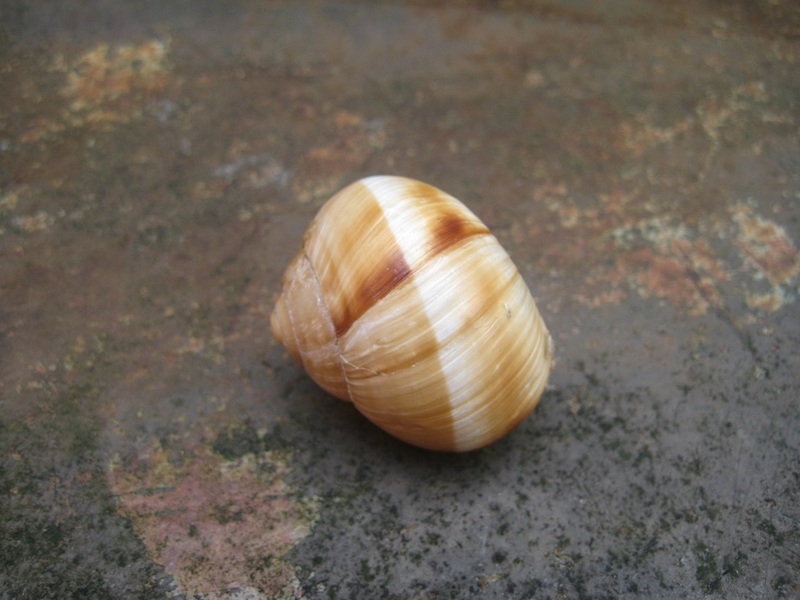 Another cacher: hello, Muriel the Pluriel. 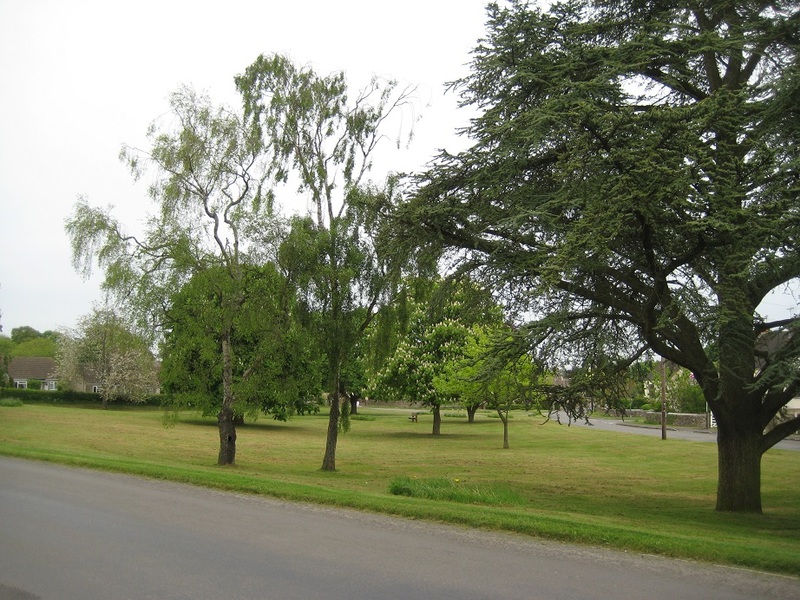 The next section of our walk back to Sandhurst would pass through Fairford. As the crow flies it was a distance of about 8 miles. 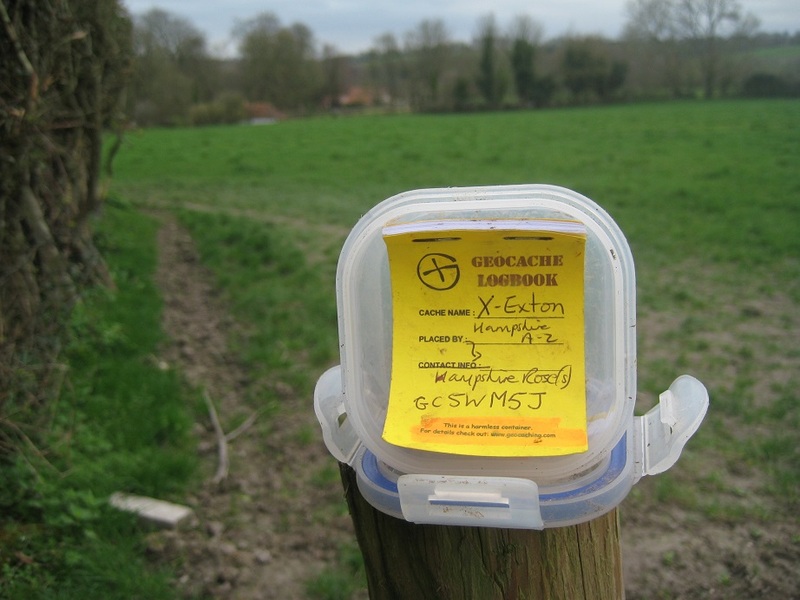 To reach Fairford would mean walking through one of the largest cache series we have seen (the Great Cotswold Walk or GCW series) comprising over 130 caches! What to do ? 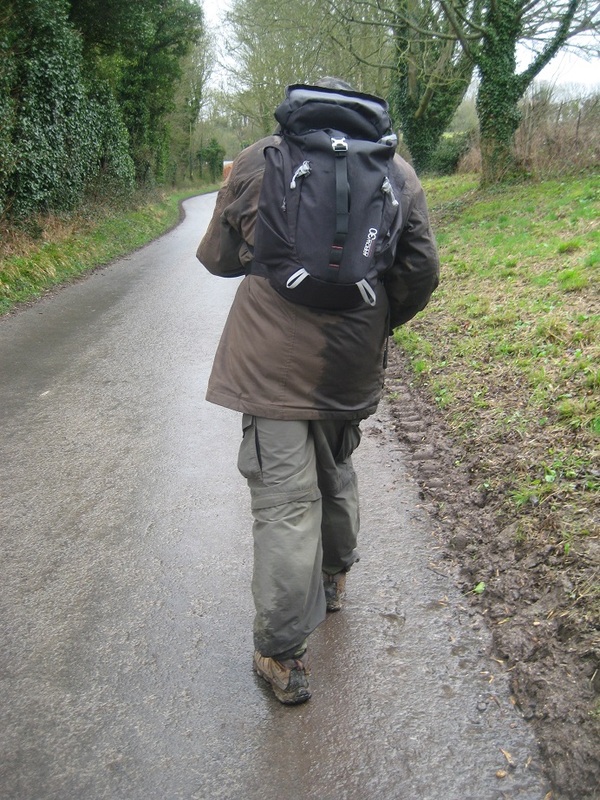 Do we walk to Fairford and ignore every cache on our way ? 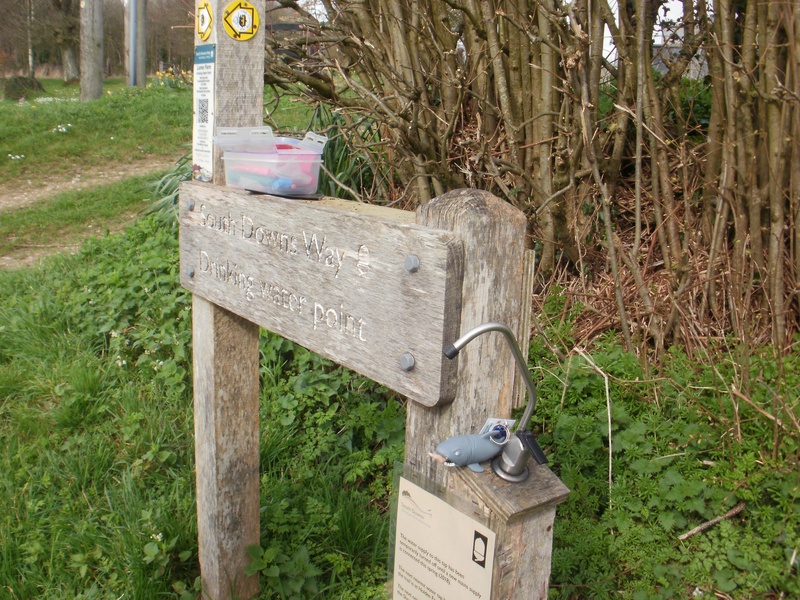 Do we walk to Fairford and attempt every other cache ? We did neither. 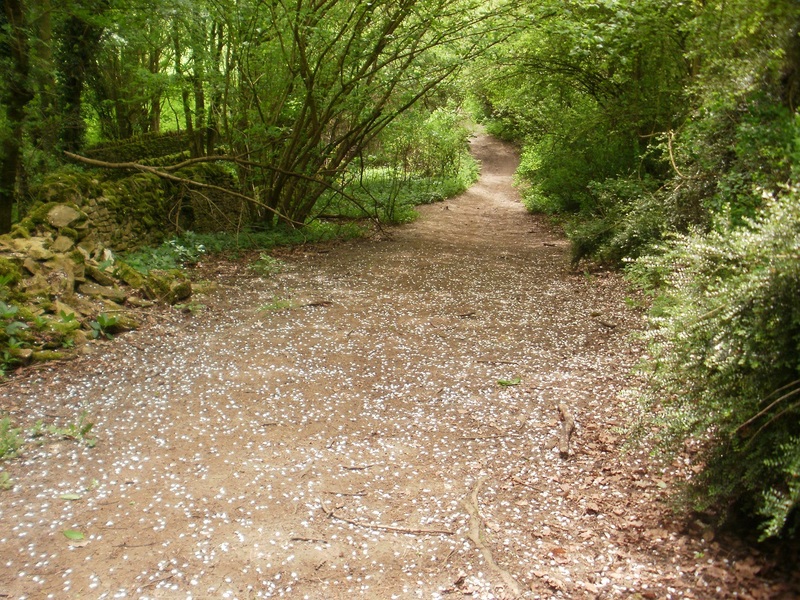 We decided to break our route at about the 4 mile mark in Bibury. 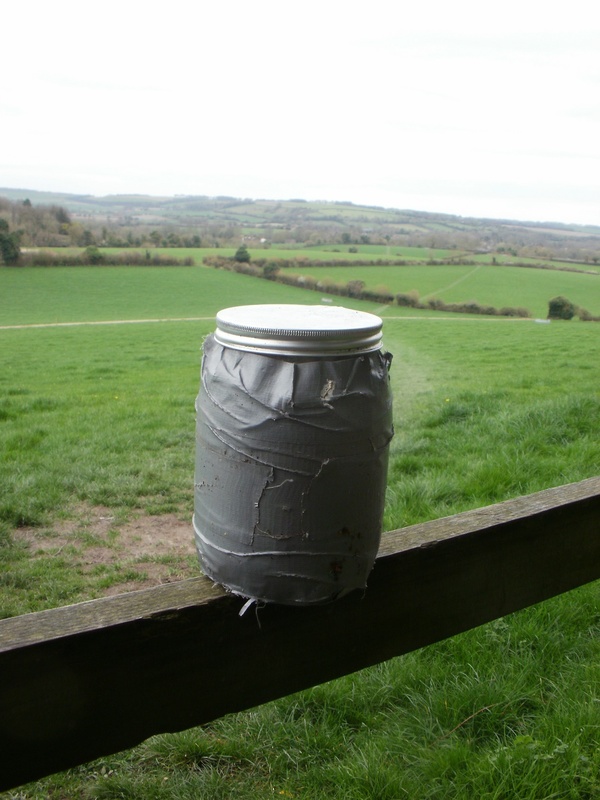 This would give us about 30 caches to find and a reasonable walk too. 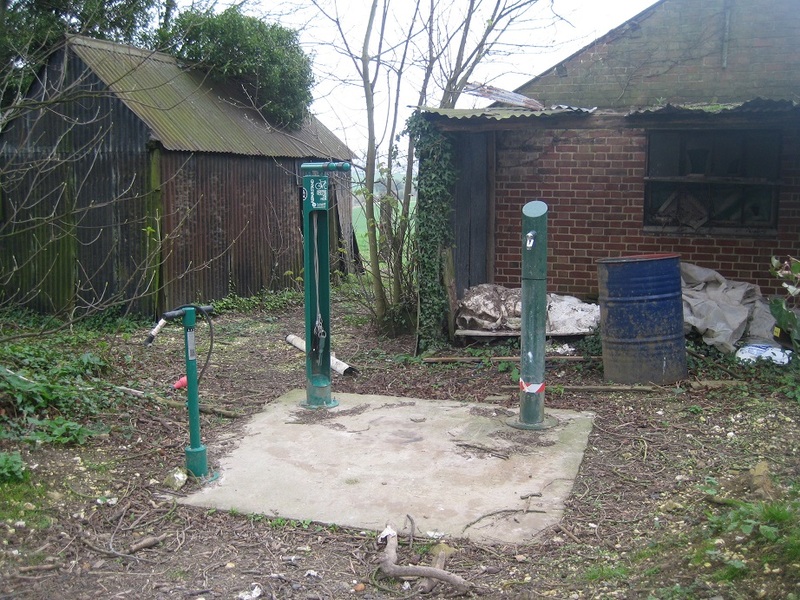 Of course there were a few other non-GCW caches to find, and after about half-a mile’s walk we reached one of these. 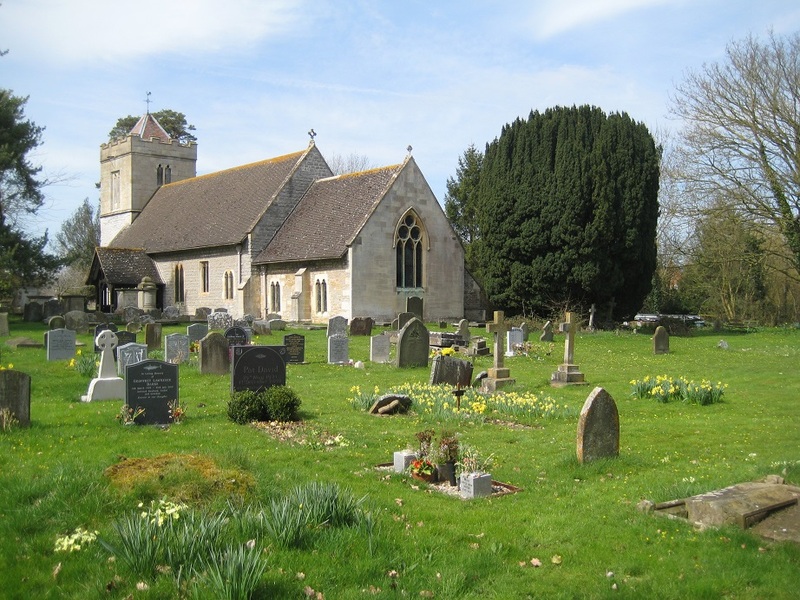 A Church Micro set in the tiny village of Coln Rogers. 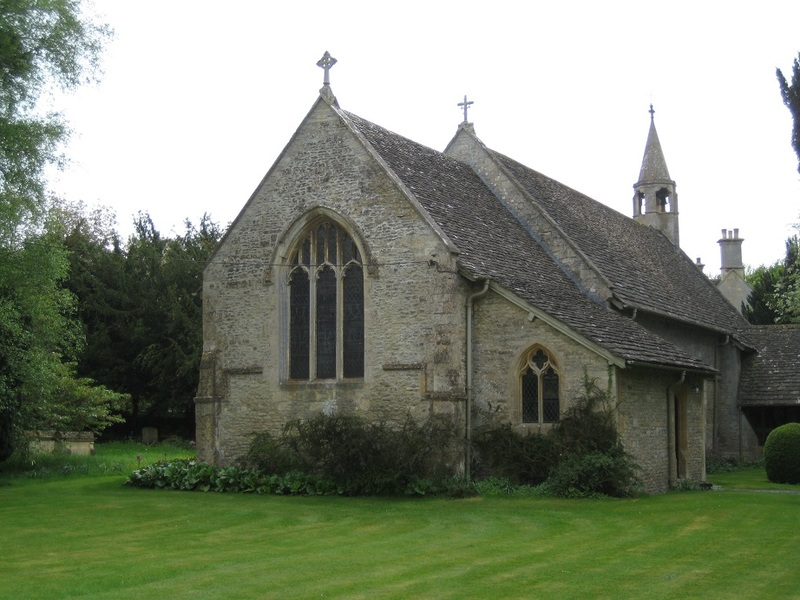 A small Saxon church. 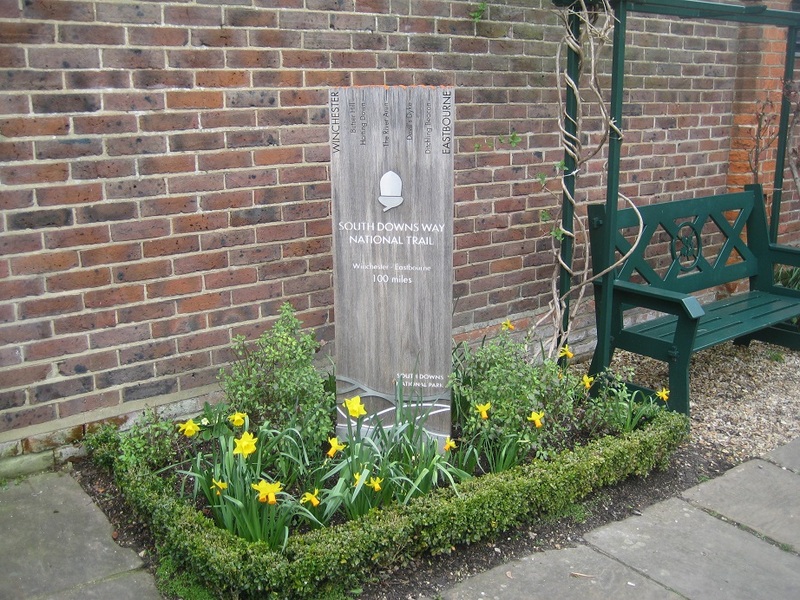 In the foyer, there was a memorial plaque to the villagers who fought in WWI. But, almost as interesting was another plaque. 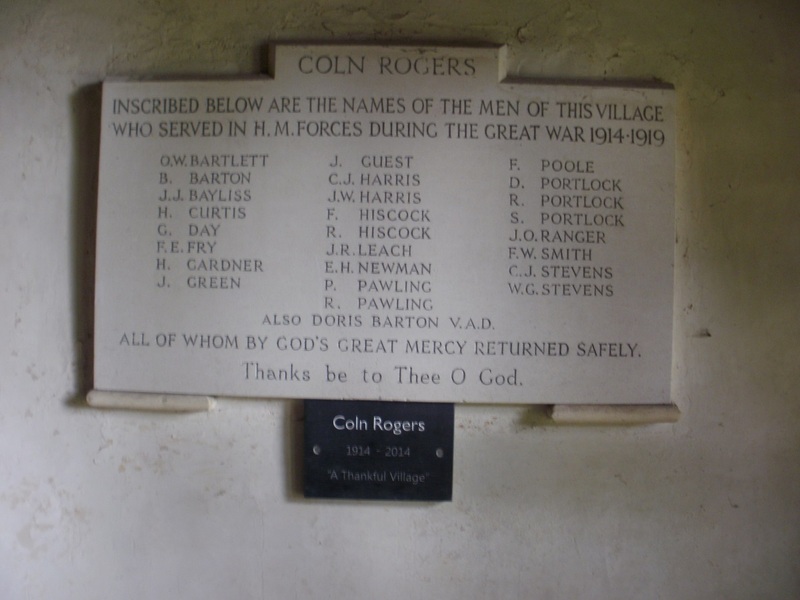 This village lost no-one during the fighting in WWI. Such villages are known as “Thankful Villages”. Our route away from Coln Rogers was tricky. Some of the ‘public footpath’ signage was obscured by verdant Spring hedge growth, which meant we started to walk through someone’s front garden! Whoops! Then the sting. 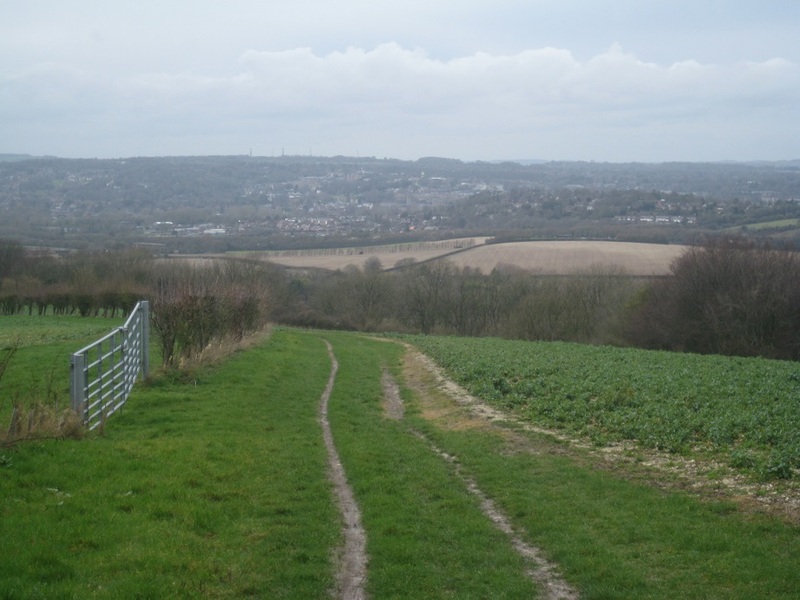 A fierce uphill climb, up a muddy path to reach a bridleway. 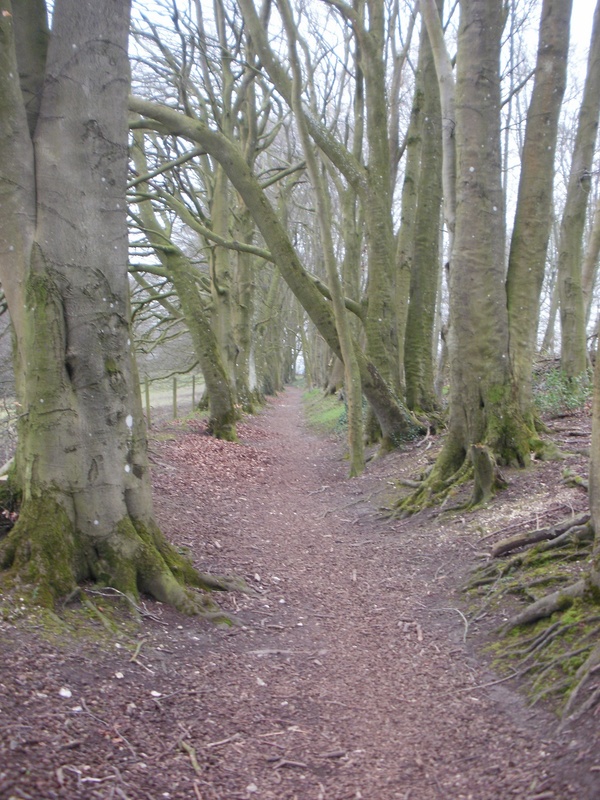 The path was muddy and slippery and the tree branches were excellent tools to aid ascent. 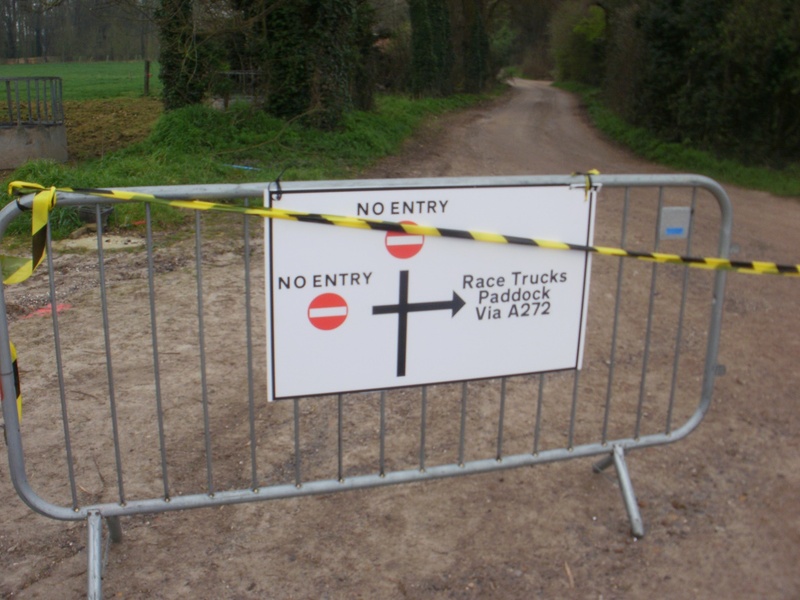 At the bridleway we had a choice. 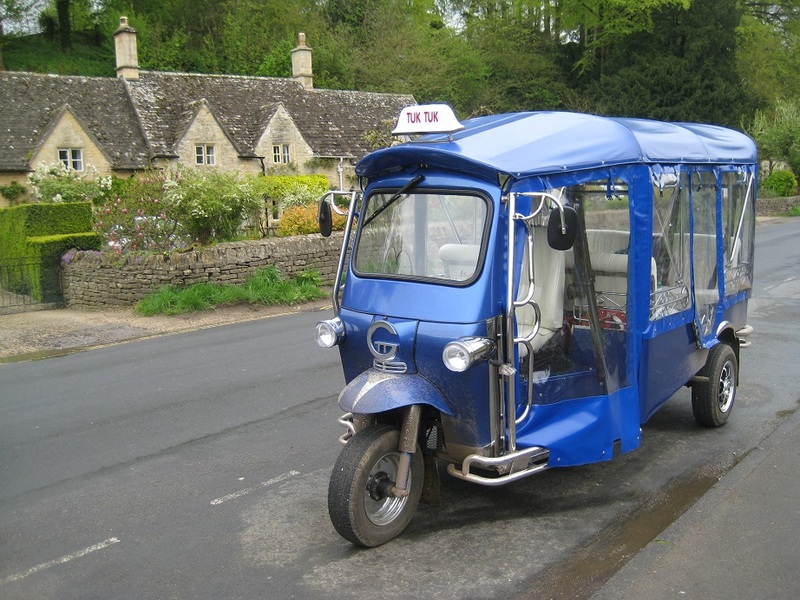 To head South to Bibury, or North to a village called Calcot before taking a different path to Bibury. We again did neither. 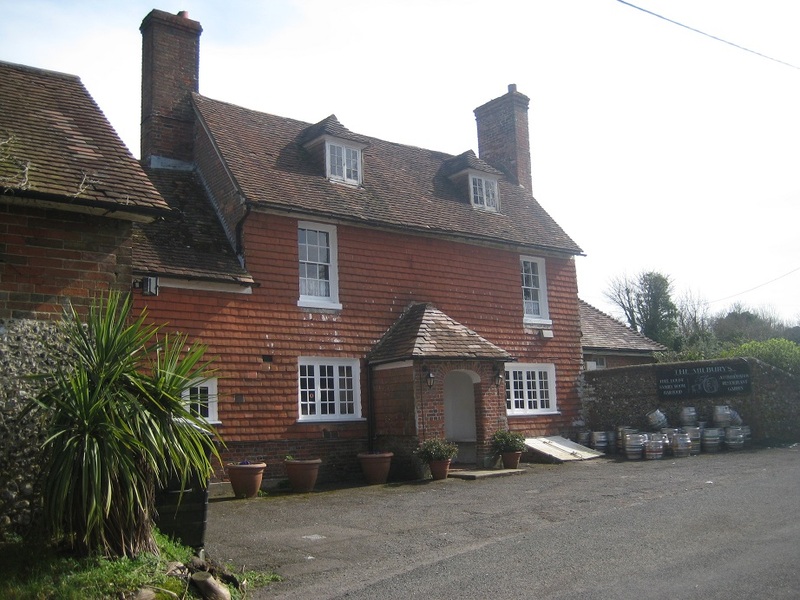 We headed South to find three caches (one had a high number of favourite points, but actually was a cache on a stick hidden in ivy) then return and head for Calcot. 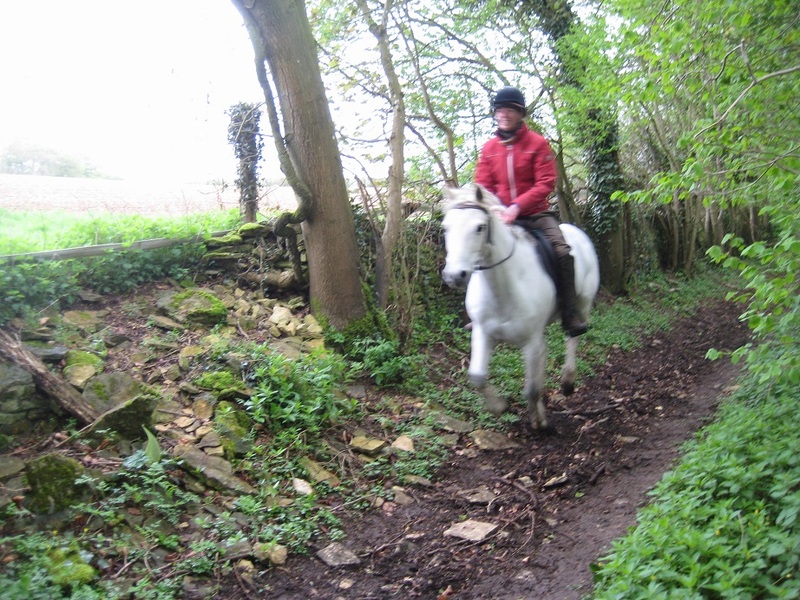 The bridleway was very muddy, but no so muddy that a horse rider galloped past us while we searching for a cache. 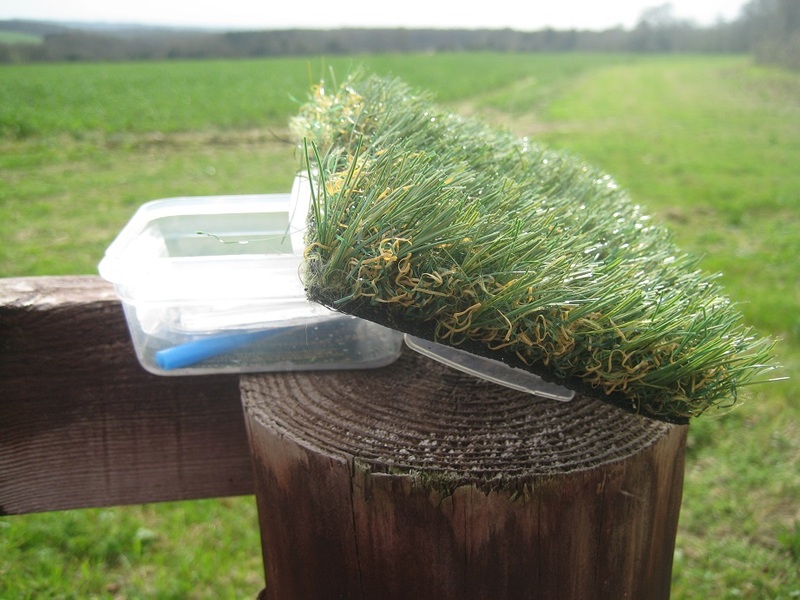 The bridleway yielded 4 caches, all very easy finds. In fact all the GCW series were easy finds. 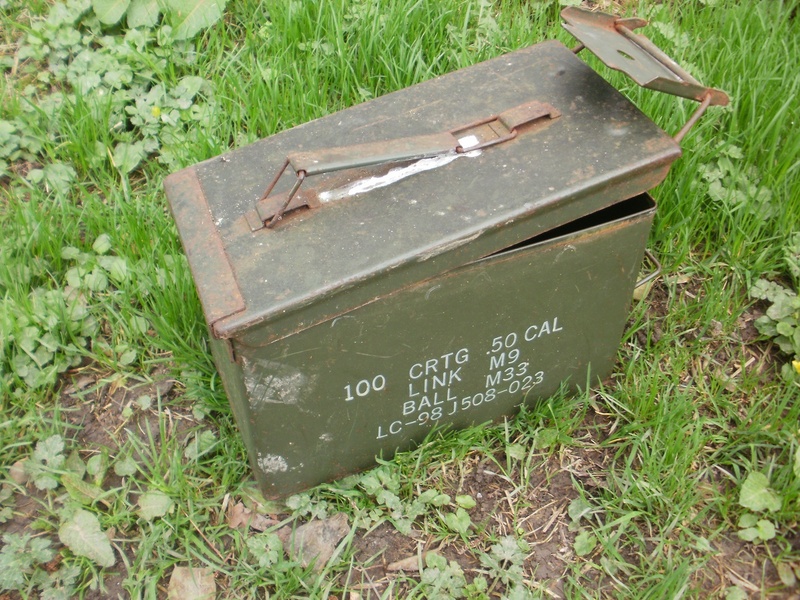 The cache owner gave very specific hints for each which made every find very quick. 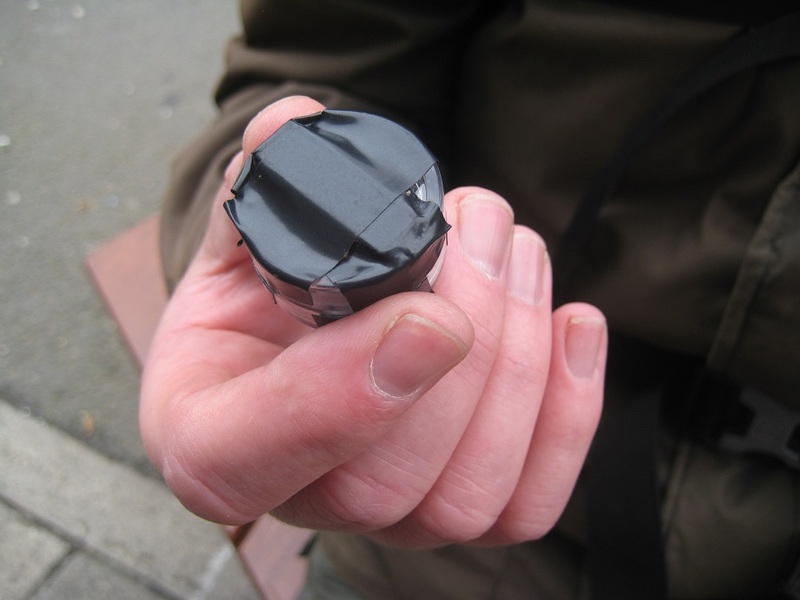 The payback for these quick and easy finds is that the majority of the caches were small film canisters, with perhaps half-a-dozen exceptions. The highlight find of the day was in Calcot. 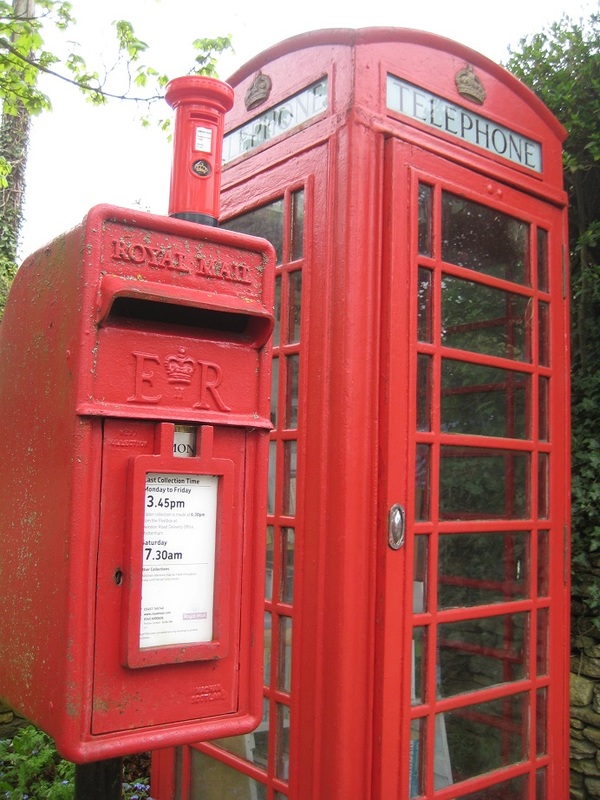 The cache was part of the ‘Fine Pair’ series, where both a red telephone box and red post box are in very close proximity to each other. Like many of the post boxes we had seen recently this was now a mini library. 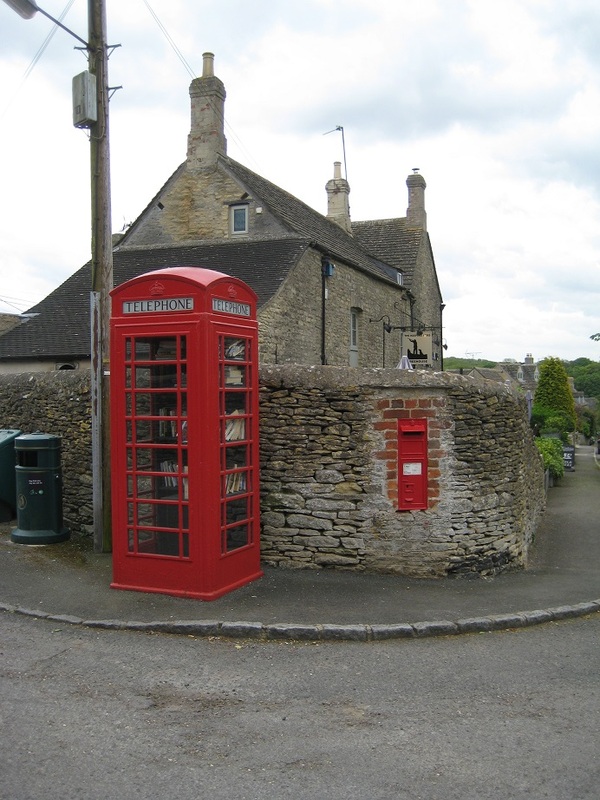 Second hand books festooned shelves, and on the floor of the telephone box, was a large metal box used by children to put money in. 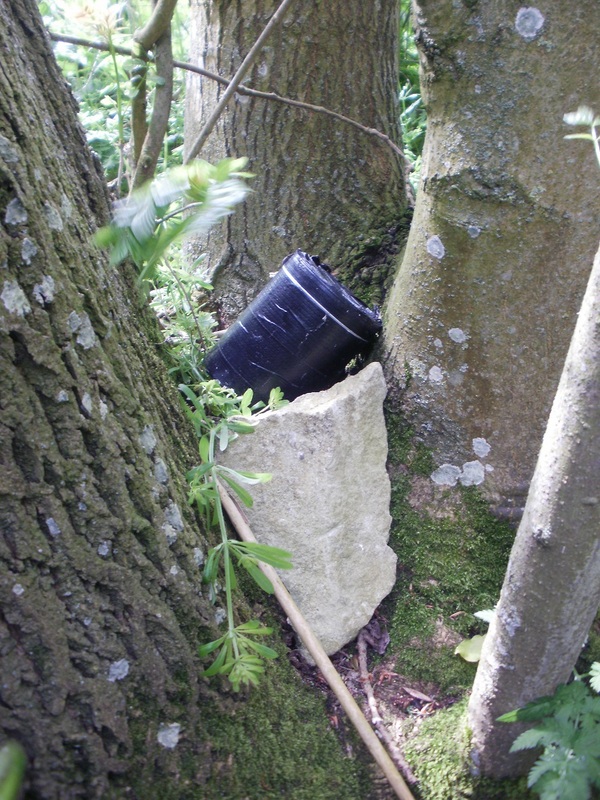 It took us a couple of minutes to realise that this was the cache! A Fine Pair.. and its cache! 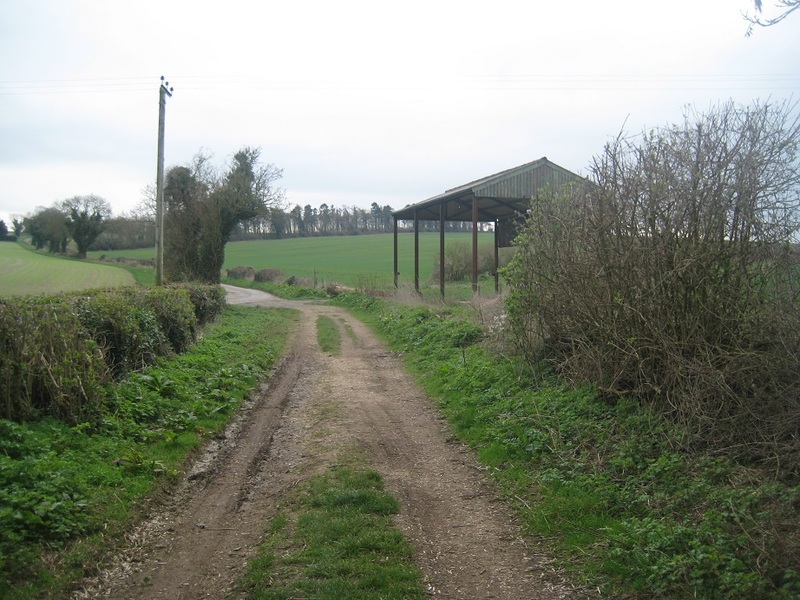 From Calcot we walked on a small road at first, then a track, then open fields. Mmm… best not to ask! 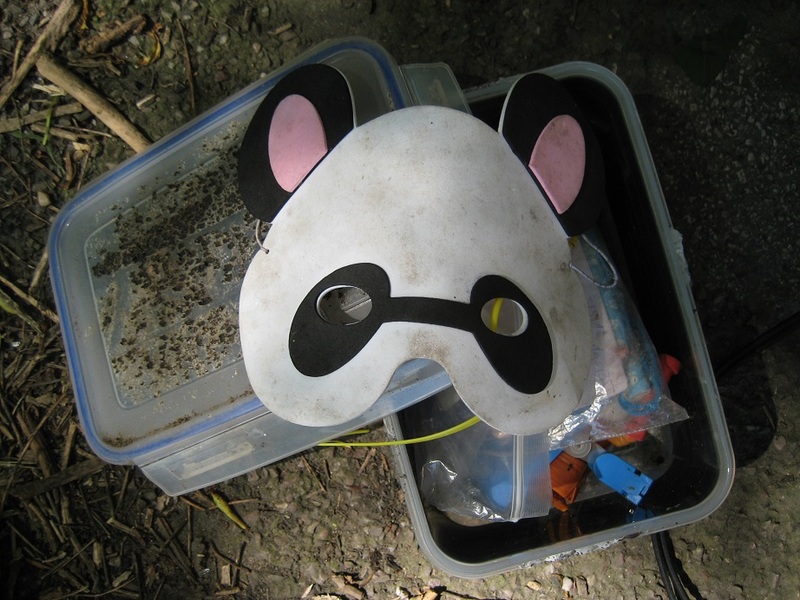 The GCW finds came relatively frequently and quickly found. 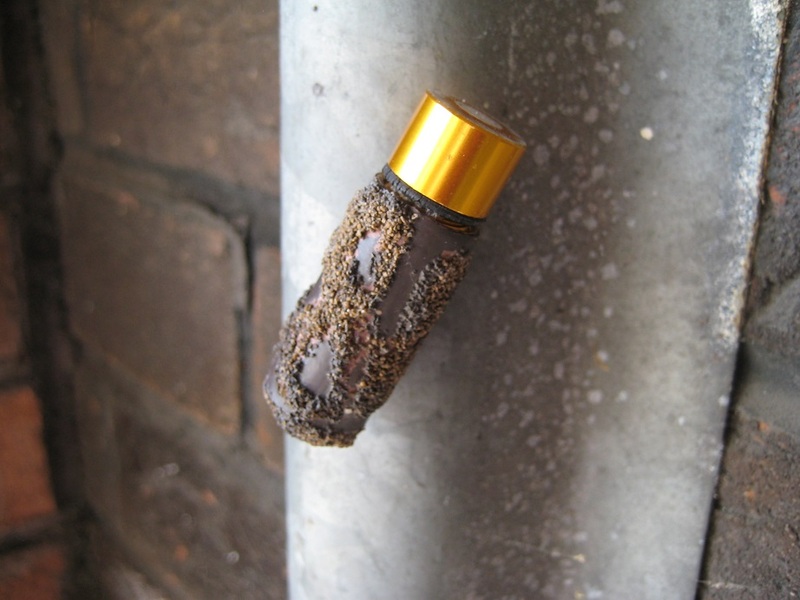 One of the trickiest to reach was screwed into the ‘orange hat’ used to mark the underground gas pipes. 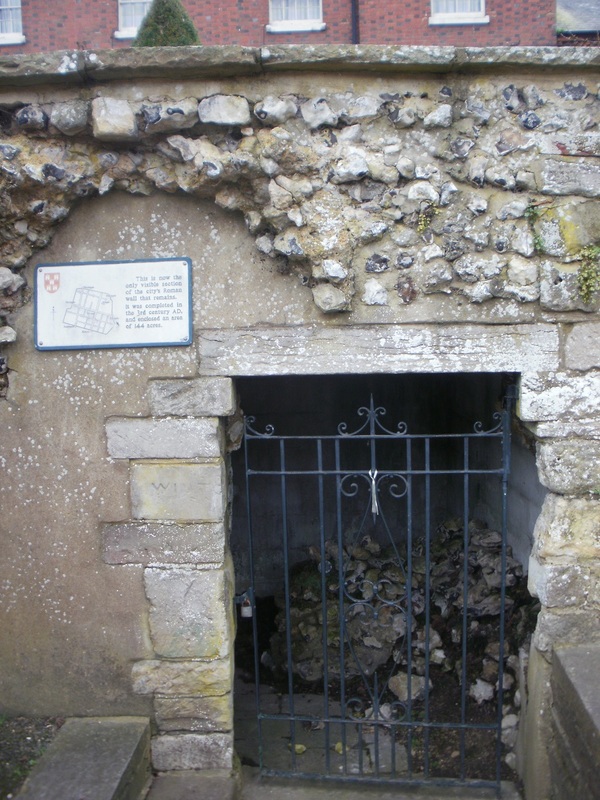 We wondered how the permission had been granted for placement on such a structure! A field of slightly-interested cows were passed, and then.. a lake. A large expanse of water covered the footpath. 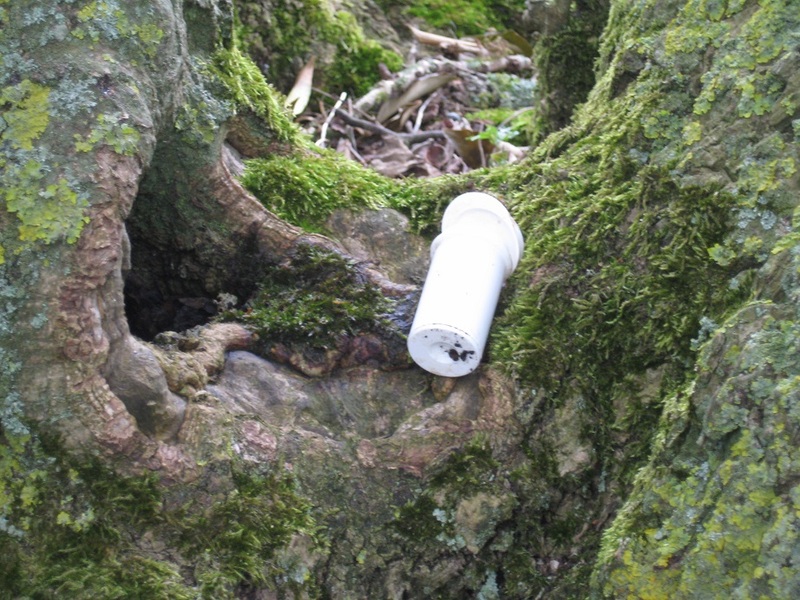 We had seen pictures on http://www.geocaching.com, but didn’t realise it was a semi-permanent feature. 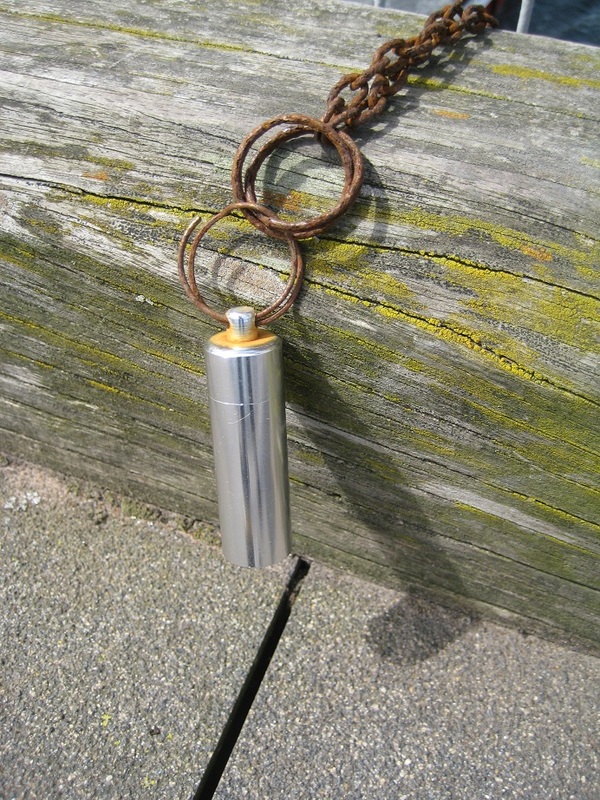 The cache owner knowing this, had placed the next cache some way from the ‘true’ footpath, so that it could be used a bearing to guide cachers around the lake. Very thoughtful. Has anyone got a boat ? We had seen no-one all day, then suddenly there was loud barking. We were approaching some kennels and the dogs were barking at a Duke of Edinburgh’s party heading in the opposite direction to us. As usual a collection of teenagers exhibiting little map-craft were being ‘guided’ by a leader some yards behind. We warned them of the lake and the cows! The kennels were just outside the small village of Ablington, where we decided to go slightly off route and collect a couple of extra GCW caches. Here a bus stop seat provided us with the opportunity for a breather, and to sign the log of an adjacent cache – wedged in a squashed film canister tucked behind the village notice board, in a concrete bus shelter. 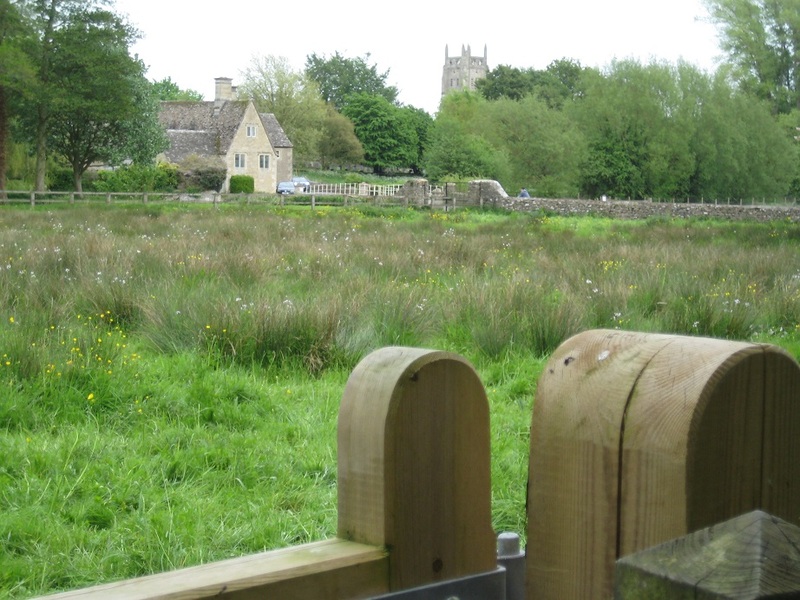 We had been following, albeit from afar, the River Coln from the North, but at Ablington we crossed the river to walk on the river’s Southern bank to Bibury. 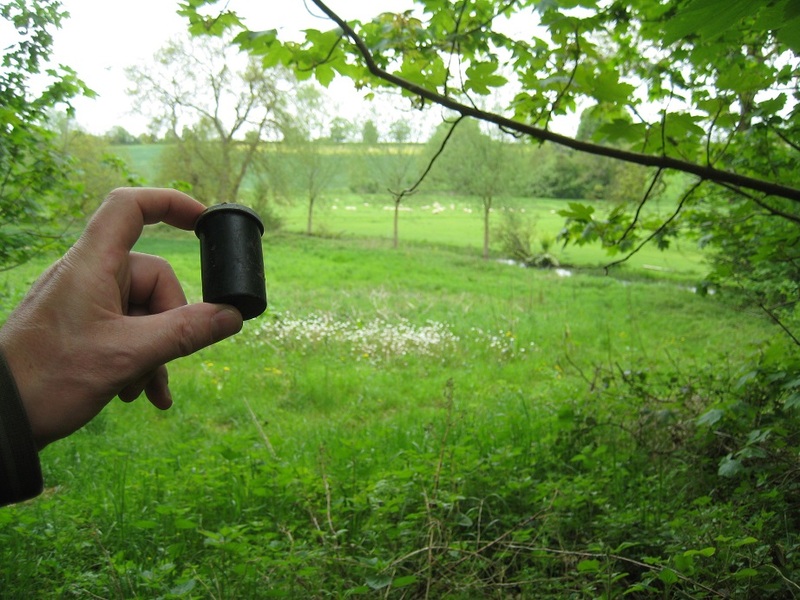 We struggled with a couple of these caches – our brains must have been fading – or the GPS wasn’t as accurate as it could have been, but we arrived in Bibury having found every cache attempted. Fortunately for us we could bypass the town and head in from a different direction. 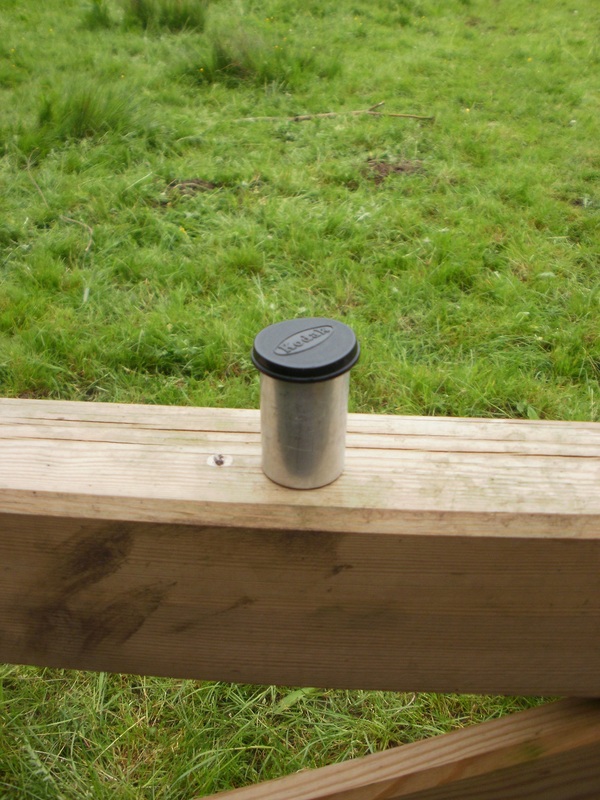 A cache under a horse trough and another next to the Cricket Field both retrieved with minimal muggle interference. 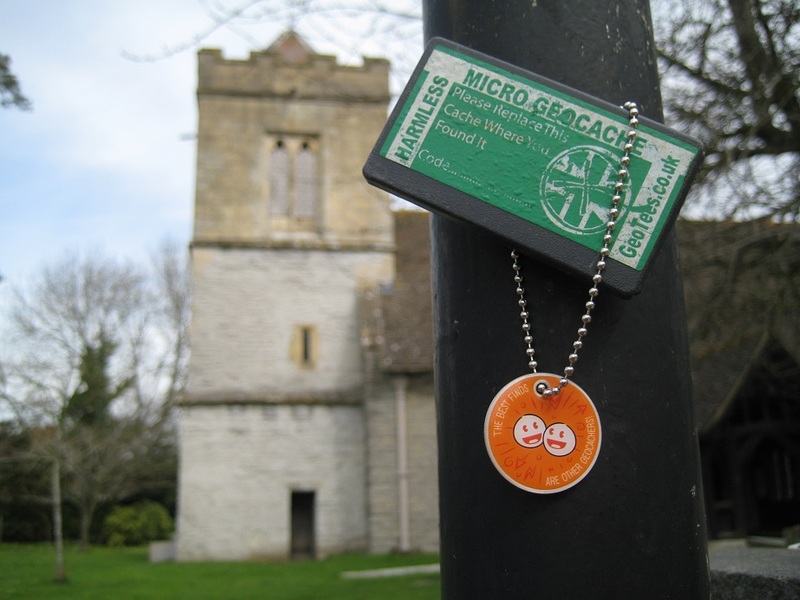 Our final cache on our walk was, like our first, a Church Micro. This time we had some memorial stones to find and undertake a simple calculation to acquire the co-ordinates for the final hide. 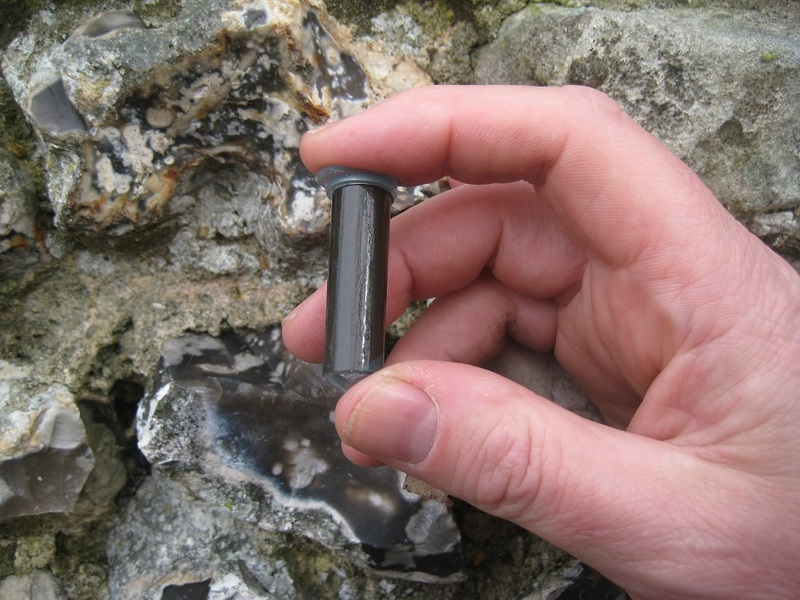 (The term ‘simple calculation’ doesn’t apply if its the last cache of the day!). We then discovered we had walked by GZ some 15 minutes earlier. Grr! However what a find! 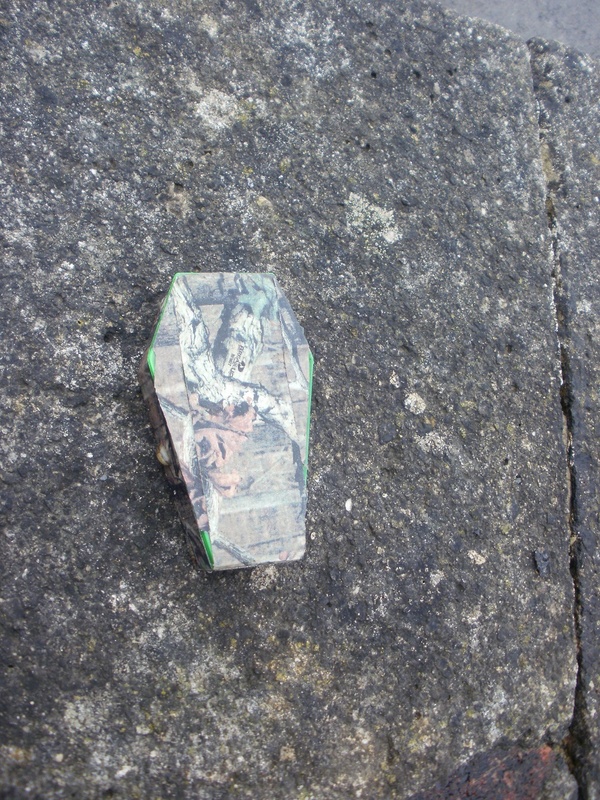 The cache was hidden in a coffin shaped container! A macabre end to the day’s very successful walk. 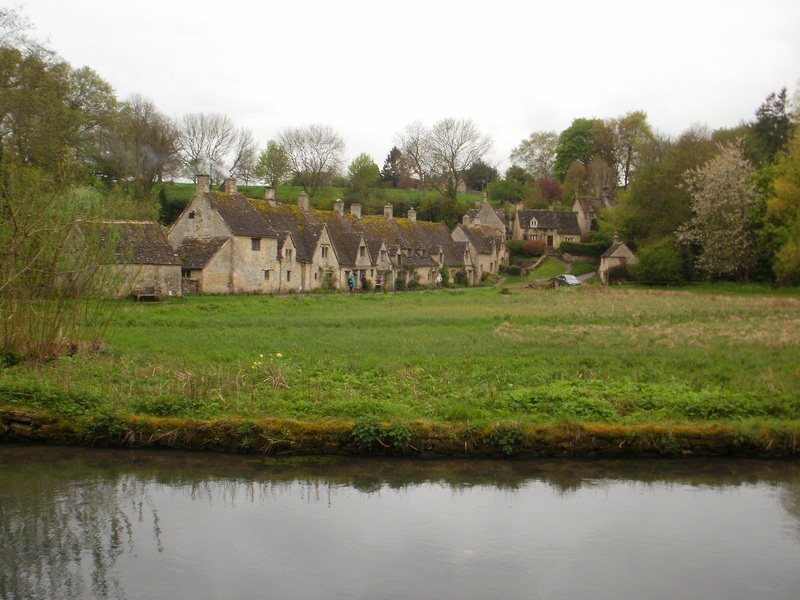 As we headed to the car, we took the obligatory photos of Bibury (now thankfully much quieter), and we realised we had equalled our best ever day’s caching. 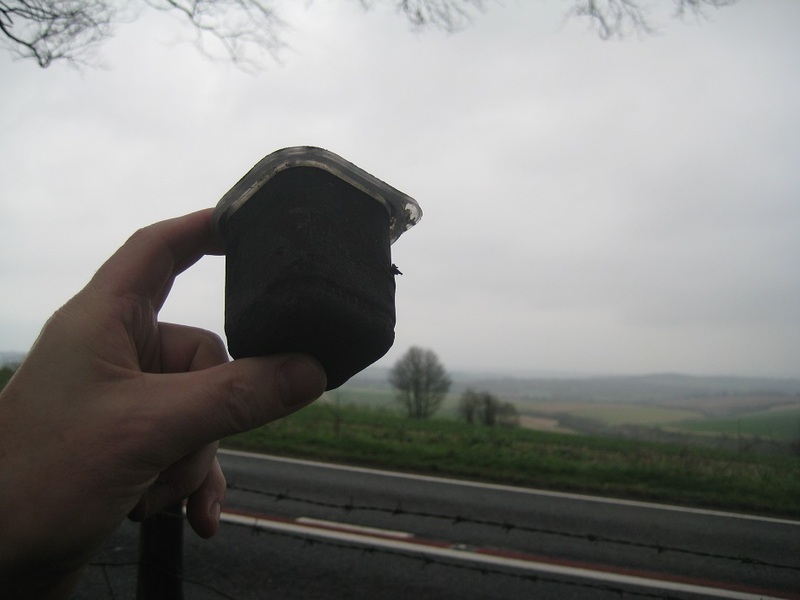 Then we remembered, there was another cache parked in a layby not far from where our other car was parked back at Foss Cross. 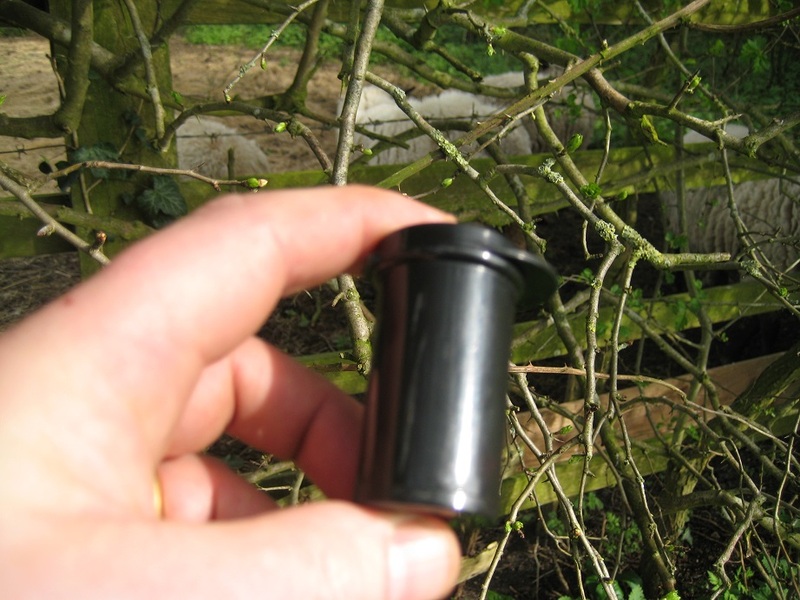 So, on the way home, we pulled into this layby, and found, not for the first time, a film canister.. yielding us a record breaking number of 31 caches! Woo ! Woo! Making progress through the GCW series! 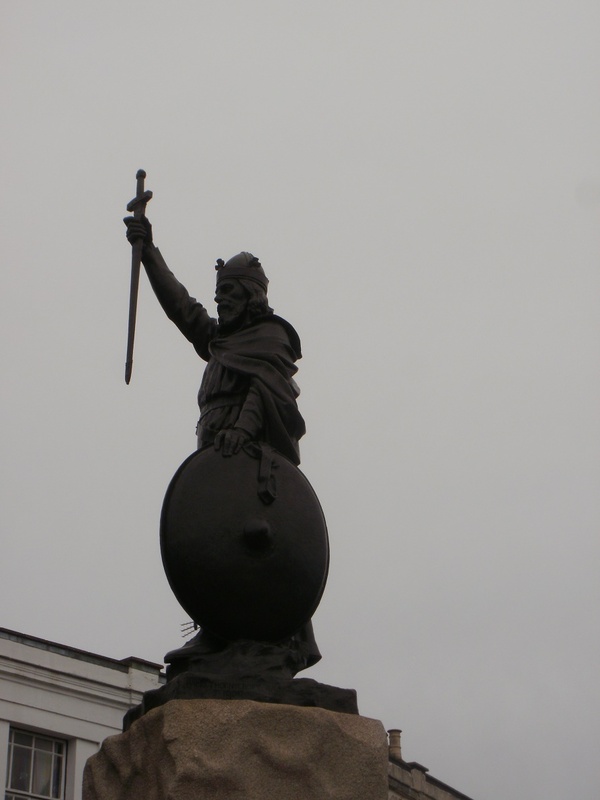 Last year, 2017, we set ourselves a challenge to walk from where we live in Sandhurst, Berkshire to Sandhurst, Kent. 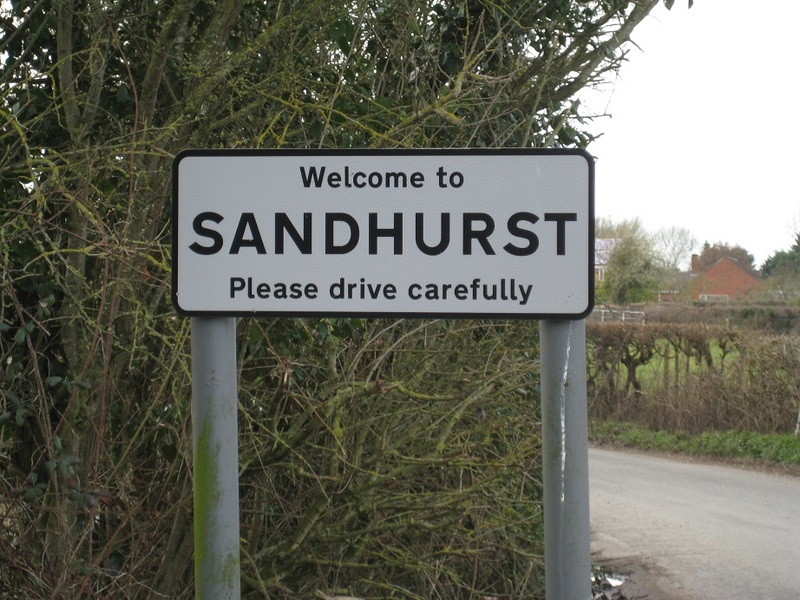 There is a third Sandhurst in the UK, which is just a few miles North of Gloucester. 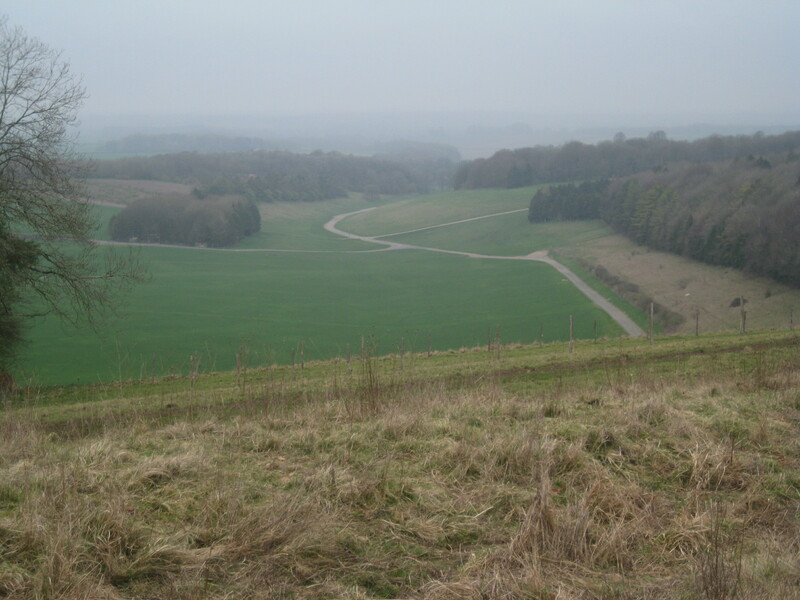 This year’s challenge is to walk, (and cache of course) from Sandhurst, Gloucestershire to our home in Berkshire. The distance is likely to be about 90 miles. 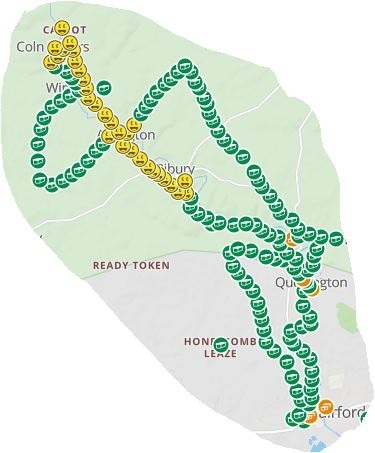 As last year, we will try to walk a relatively direct route, but again like last year we do have to avoid certain obstacles such as Army Land, Airports, Rivers etc..
We are starting our challenge later this year as Winter’s short day-length coupled with a 2 hours drive would have meant very short trips. Then, the late Winter weather (“The Beast from the East” x 2!) scuppered our start dates in February/March. So, some weeks later than planned, we booked a weekend away to start our walk and cache our way home. 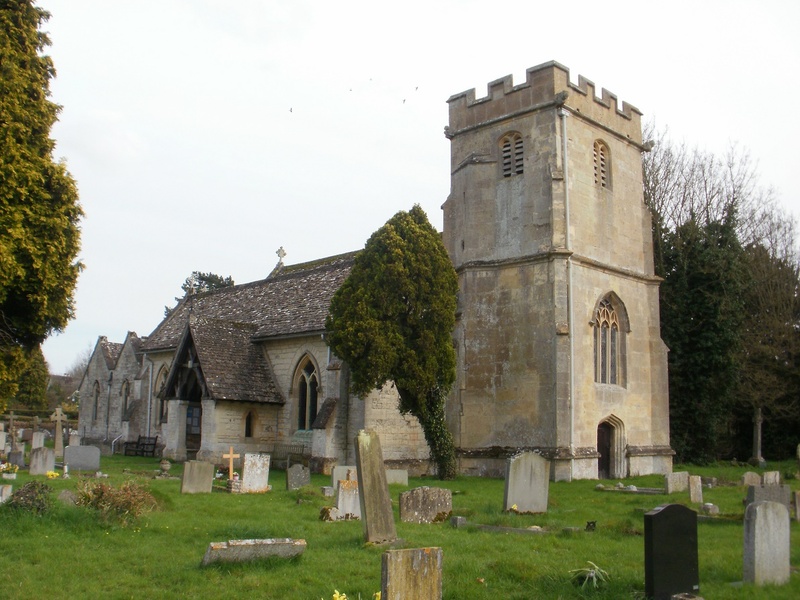 Sandhurst (Gloucs) is a relatively small, strung-out village just off the A38. There is one road in, and another out. 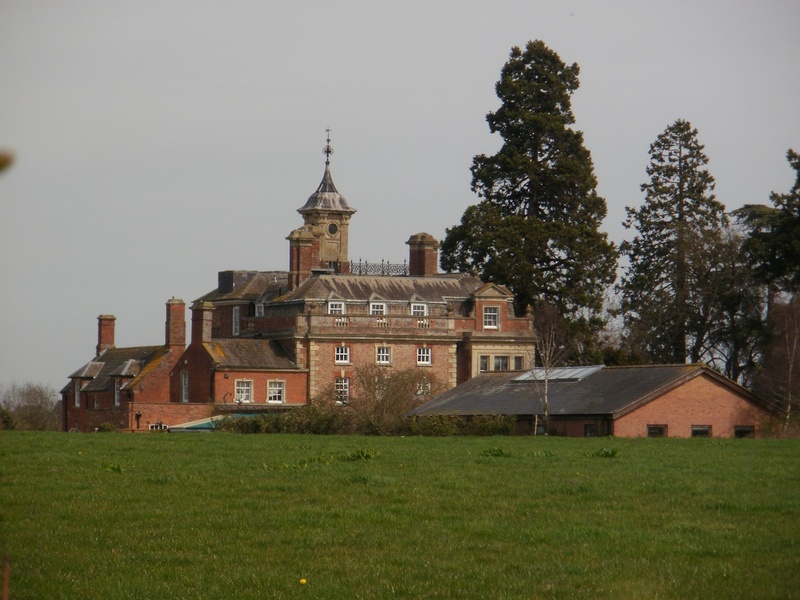 Its location near to the River Severn means when the River floods, Sandhurst can be cut off. 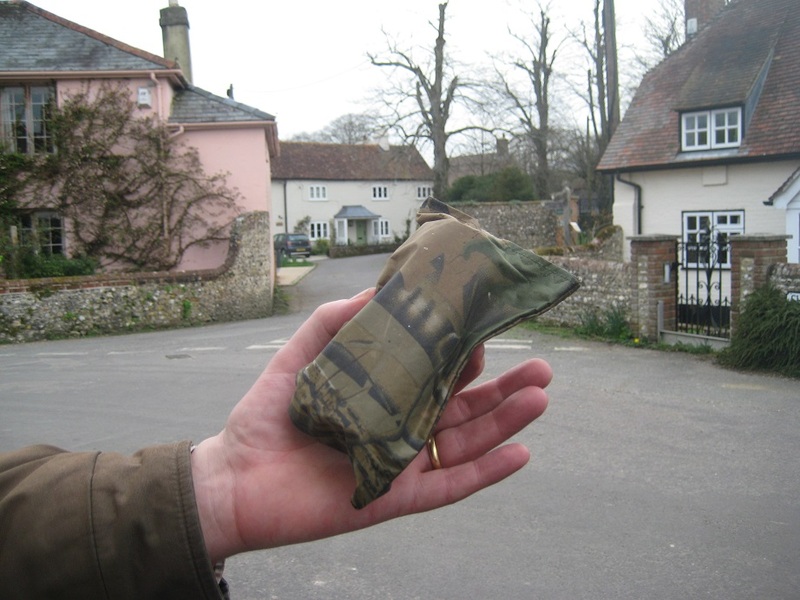 We parked a car in the church car park and very quickly found our first cache. 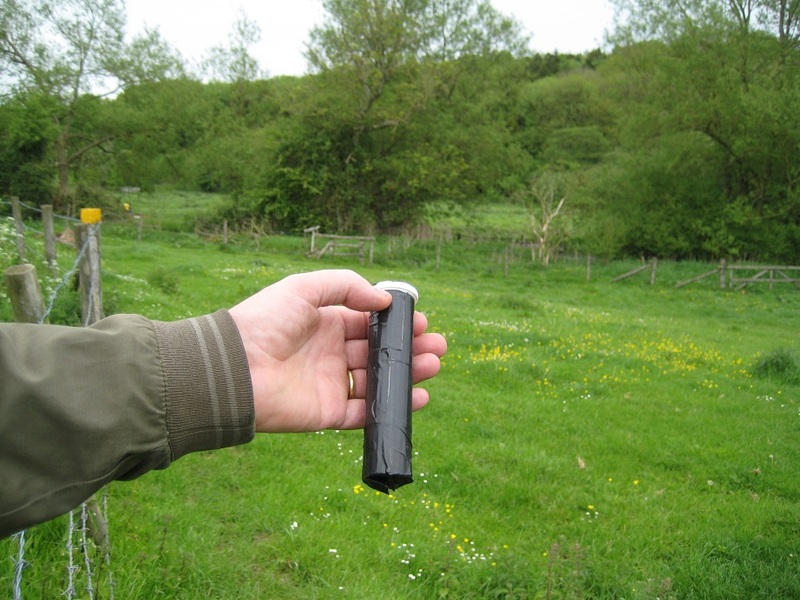 The GPS said ’17 feet away’ and before we could check the hint, the magnetic micro was in Mrs Hg137’s hand. Signed, replaced. Very easy. Fingers crossed for an easy ride for the next 90 miles! Before we headed East, we wanted to see the River Severn. It had been on high flood alert (red alert), for the previous 4 days and we wanted to see how full it was. We never got there! 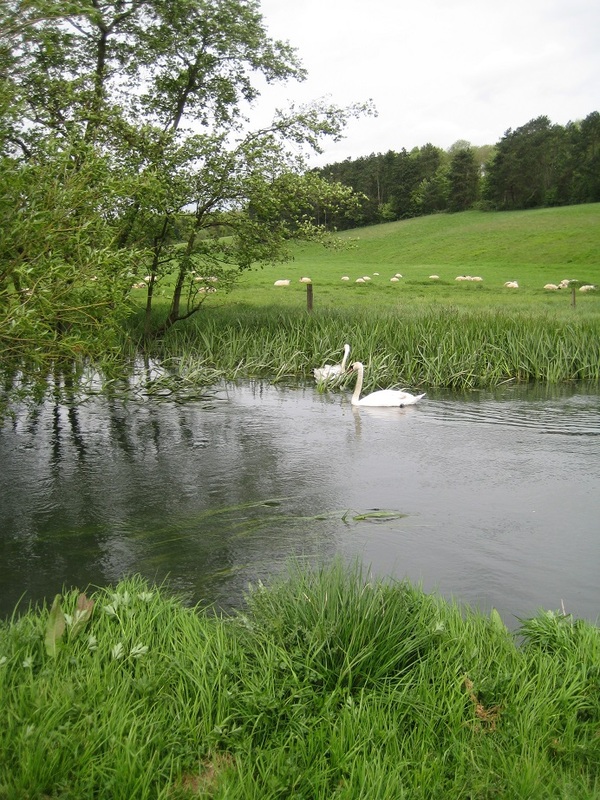 After walking through a farm we arrived, just 2 fields away from the river-bank. But that first field was one large puddle! 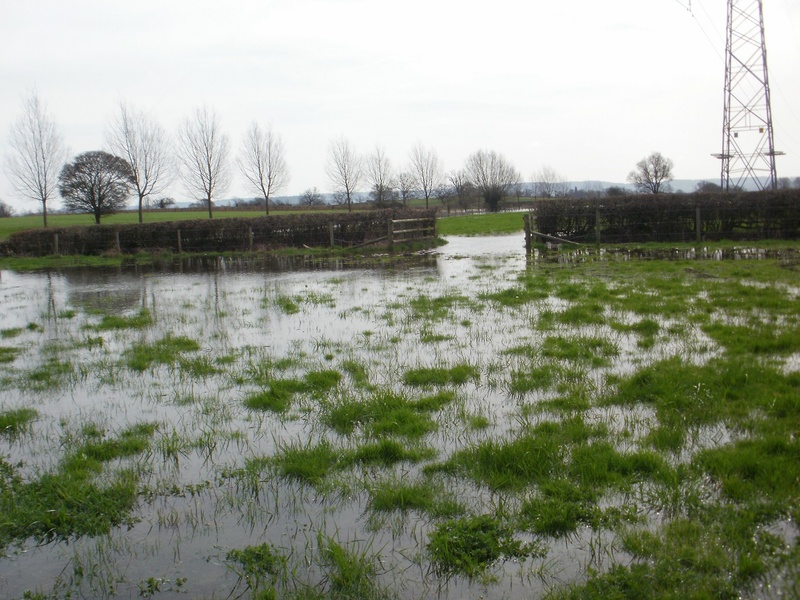 Water was gushing in from another field, our exit stile was in the middle of a lake. We abandoned our visit to the River Severn, though we both ended up with some of its water in our boots! 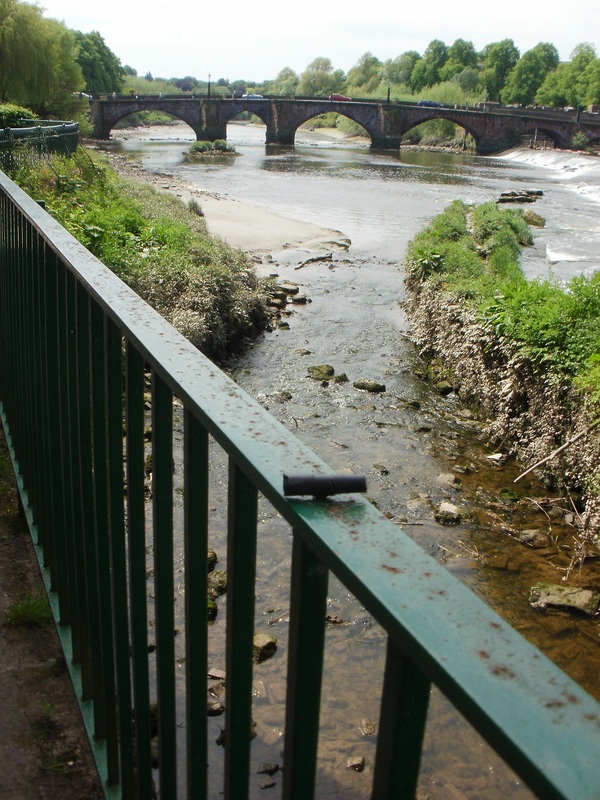 Should the River Severn really be this close ? 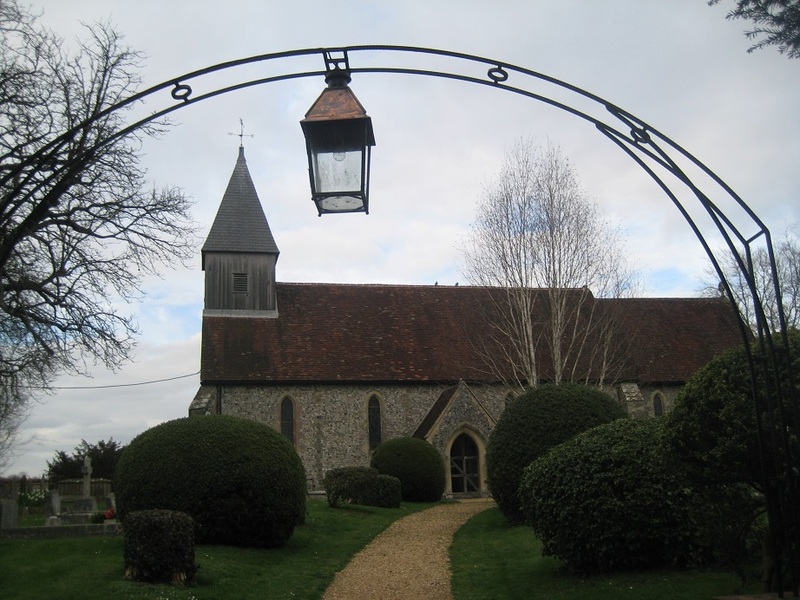 Sandhurst Church, where we found the first cache, is relatively old and dedicated to Saint Lawrence. 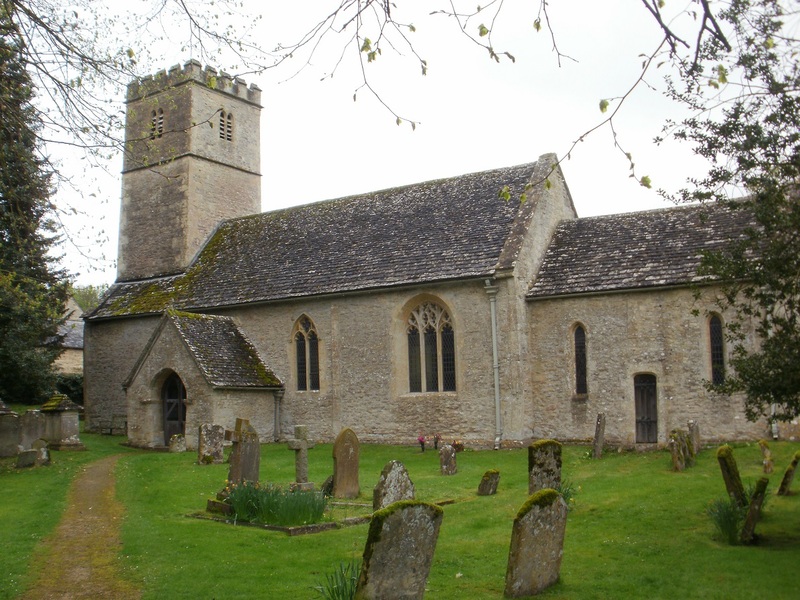 It has been a place of worship since the 14th century, and also contains a 12th century font. The peace in the church was marred by roadworks going on within yards of our parked car! 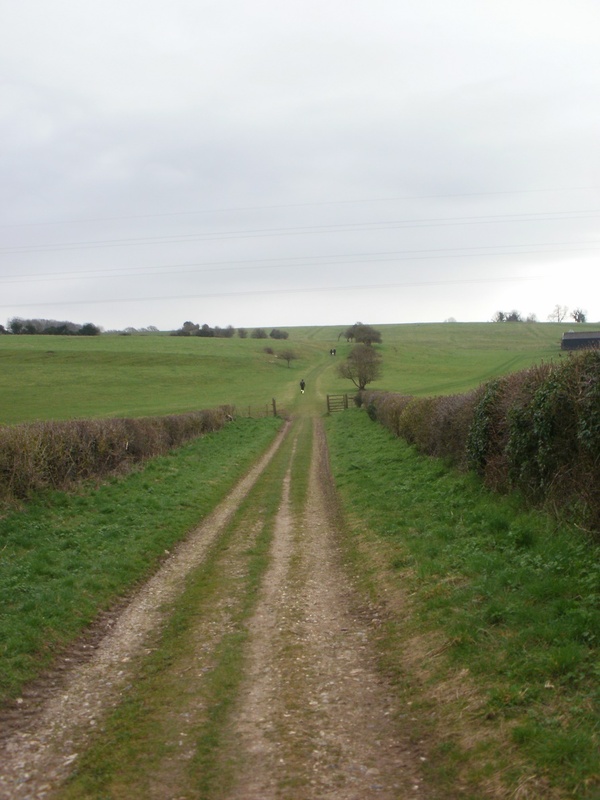 The first couple of miles of our route were cacheless, even though we went over a couple of stiles and saw ‘useful’ trees which would have made good hosts. 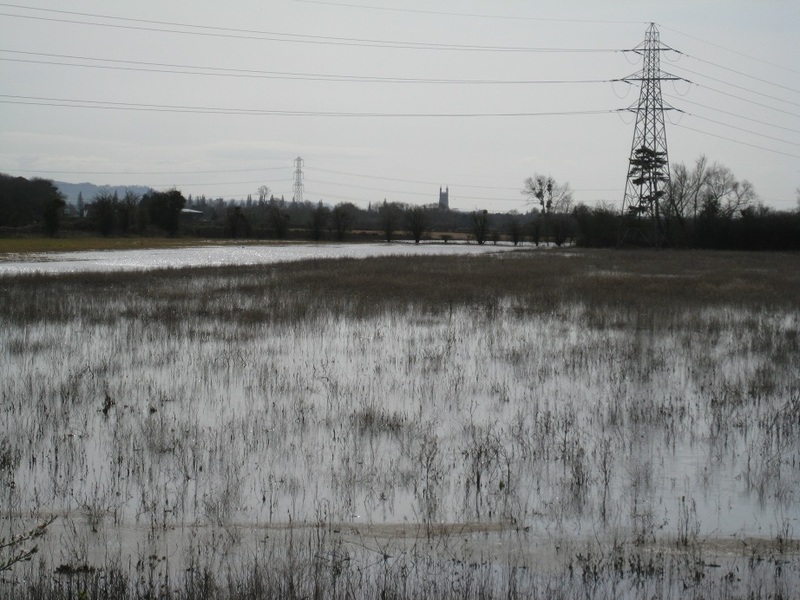 Across flooded fields we glimpsed Gloucester Cathedral; shortly after we walked near to the Nature in Art Museum. 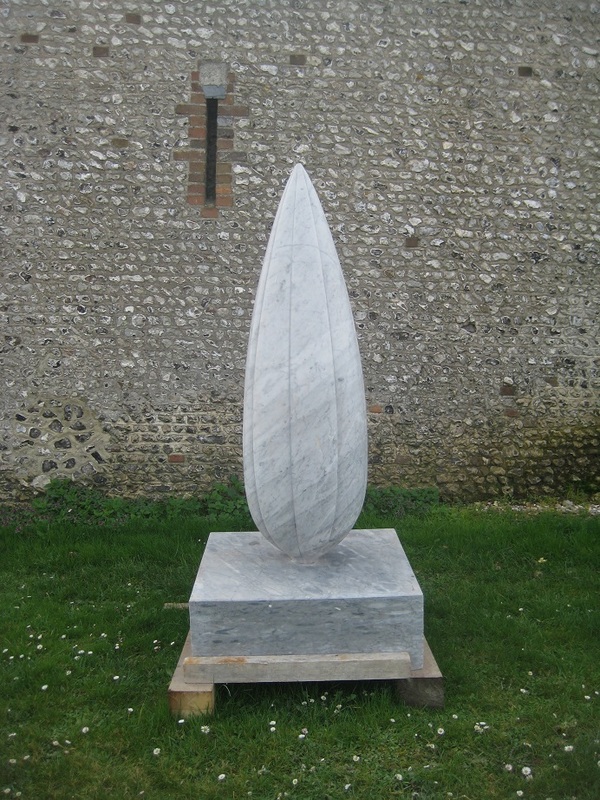 The Museum acts a gallery for artists and artworks associated with Nature. As we crossed the Museum’s drive we made a navigational error. 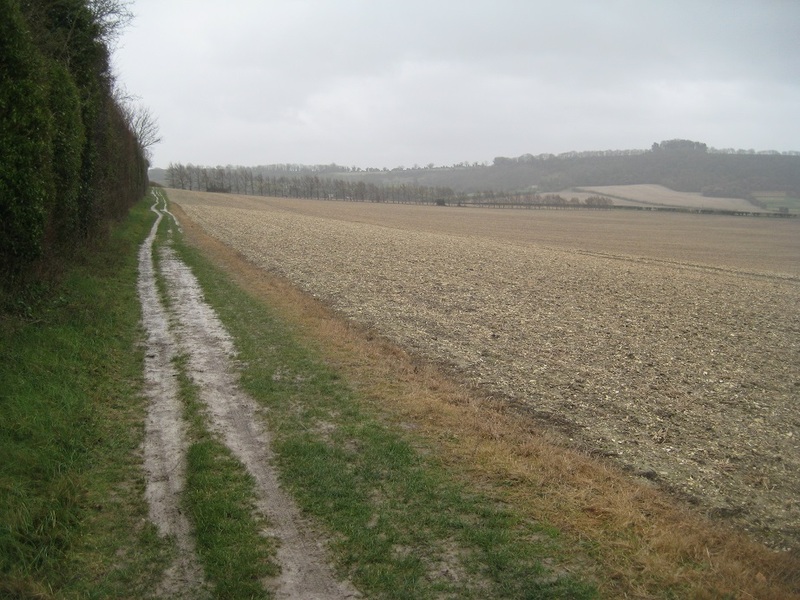 We were looking for a footpath, but we failed to realise until we had walked for 15 minutes, that there were two adjacent paths…and we had taken the wrong one. 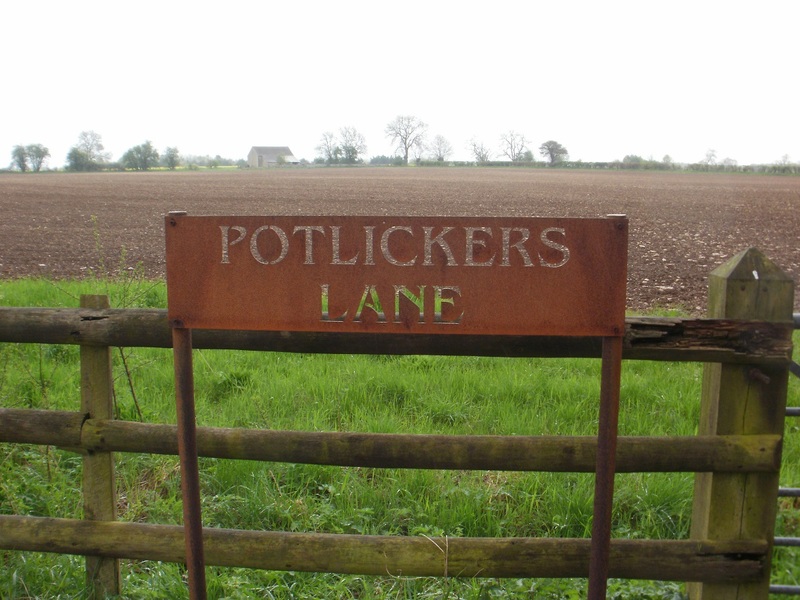 This meant we had an extra half-mile road-walking to reach the tiny village of Twigworth. 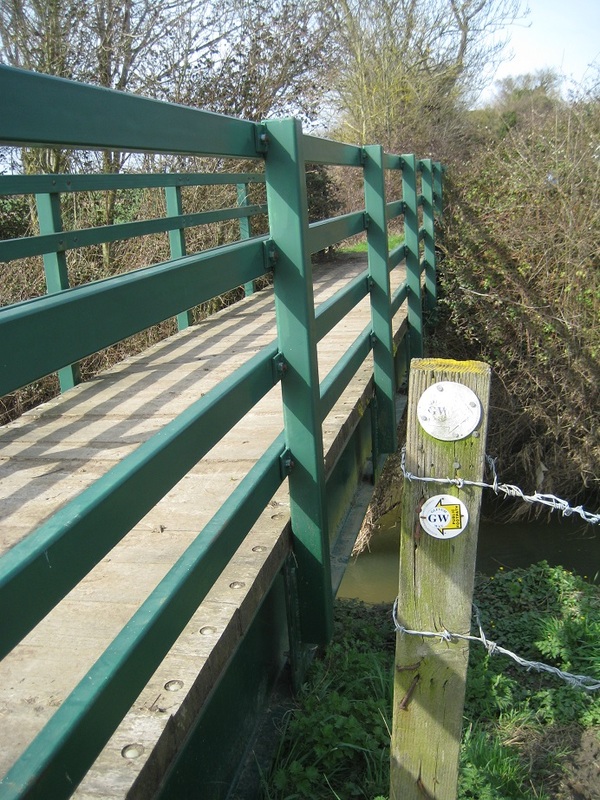 Here we crossed the busy A38,and headed for a bridge over the Hatherley Brook. We were expecting the Brook to have overflowed its banks too, but it hadn’t which meant we could try to find three caches close to its banks. 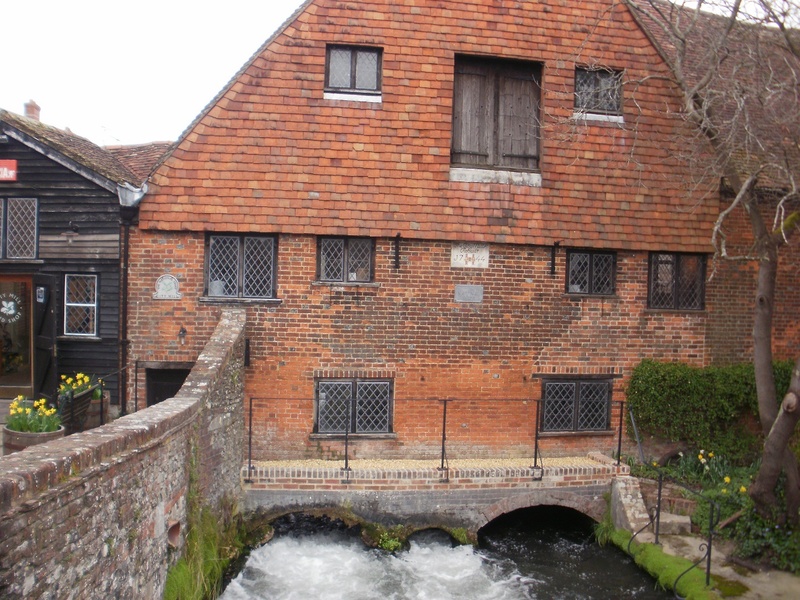 The first ‘Green Troll House’ was on one of the bridges. We took sometime to find this cache. Magnetic. Hidden under feet, but not under the bridge. Very specific. But we fingered the bridge all over. Young spring nettles defended (a bit too vigorously) a location or two and after 10 minutes we were about to give up. Then we saw the item, well concealed. A classic case of standing back and looking from a distance rather than fingertip searching. 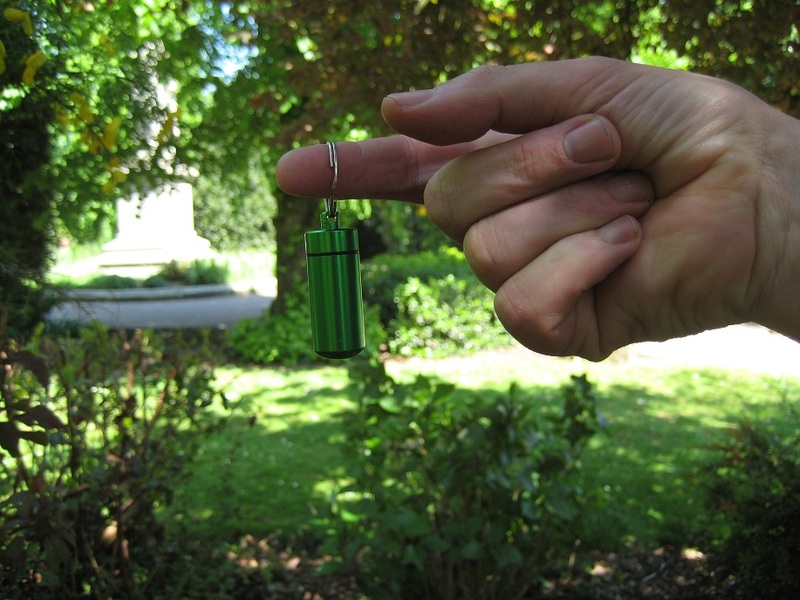 The next cache was easier. 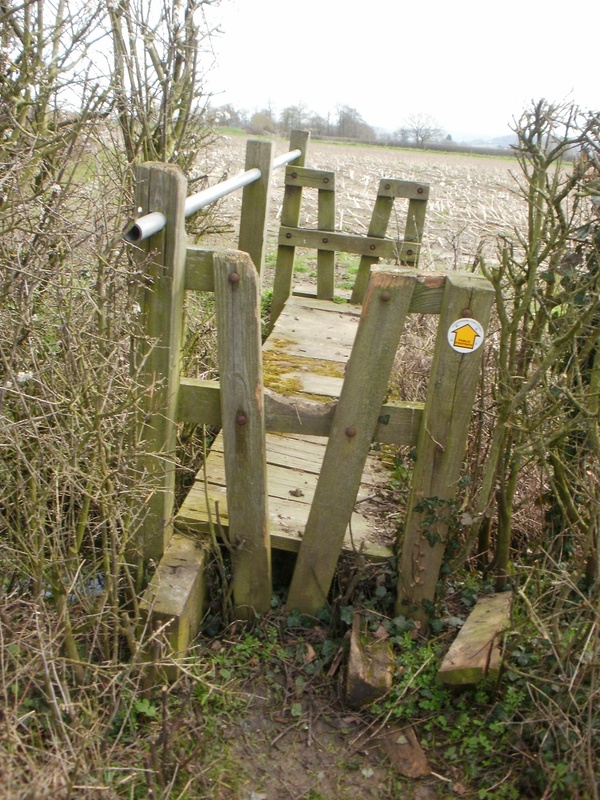 Under a stile – one of those stiles, which now goes nowhere, as the footpath bypasses it. 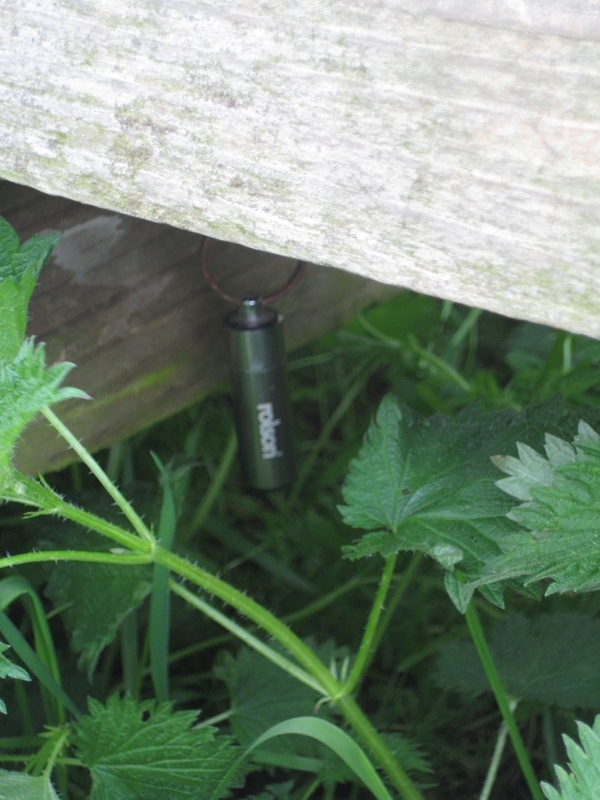 Everyone now walks by the cache without even realising it is there. 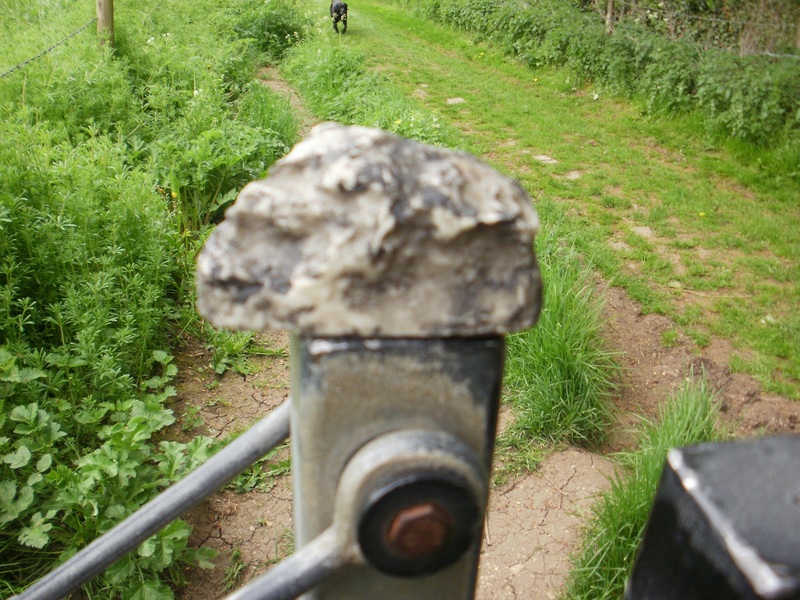 (The stile did give Mrs Hg137 a chance to ‘relace her boots’ as a few people approached just as the cache was about to be replaced). Our next cache was our only DNF of the day. 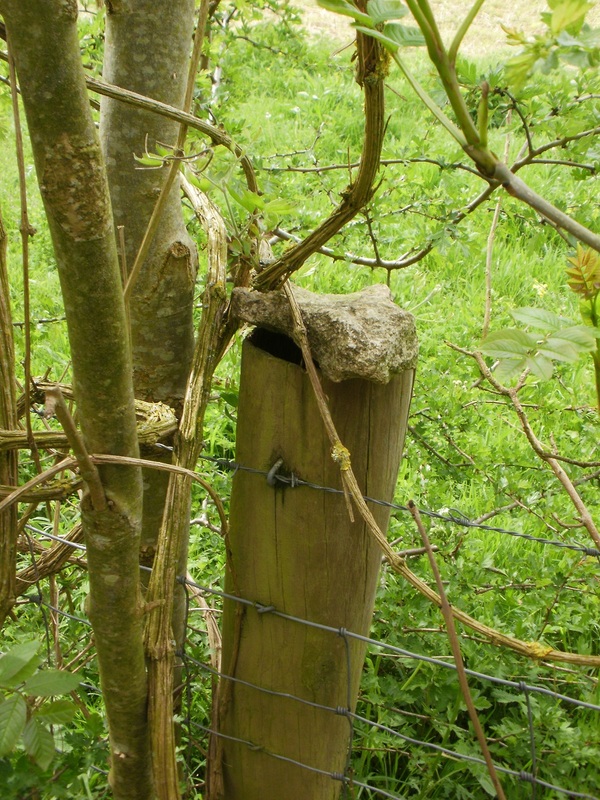 Hidden by a kissing post – it was nowhere to be seen. 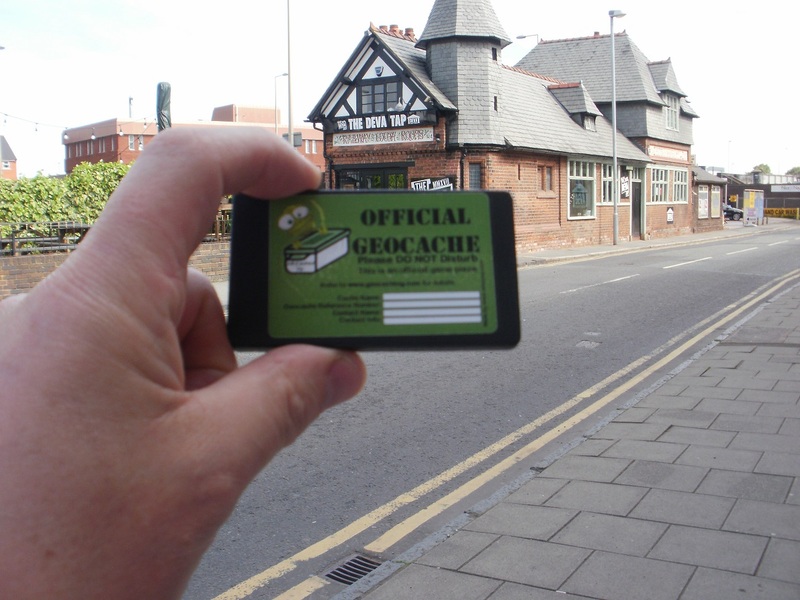 We weren’t the only cachers to log a DNF, so we are fairly certain the cache has gone. 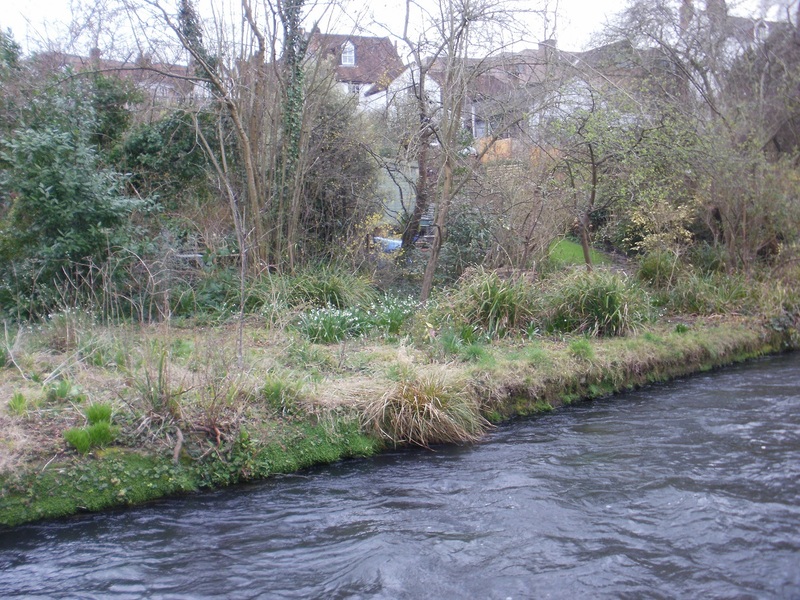 We continued following the Hatherley Brook, now adjacent to a Golf Course to Down Hatherley Church. 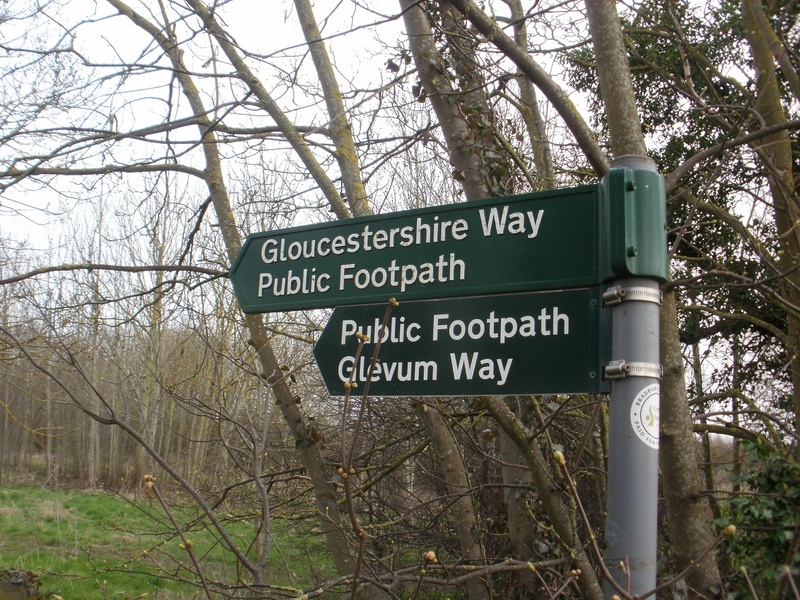 We were on two long distance footpaths, The Glevum Way which circumnavigates Gloucester and the Gloucestershire Way which is a 100 mile path visiting Stow-on-the-Wold, Chepstow and Tewkesbury. 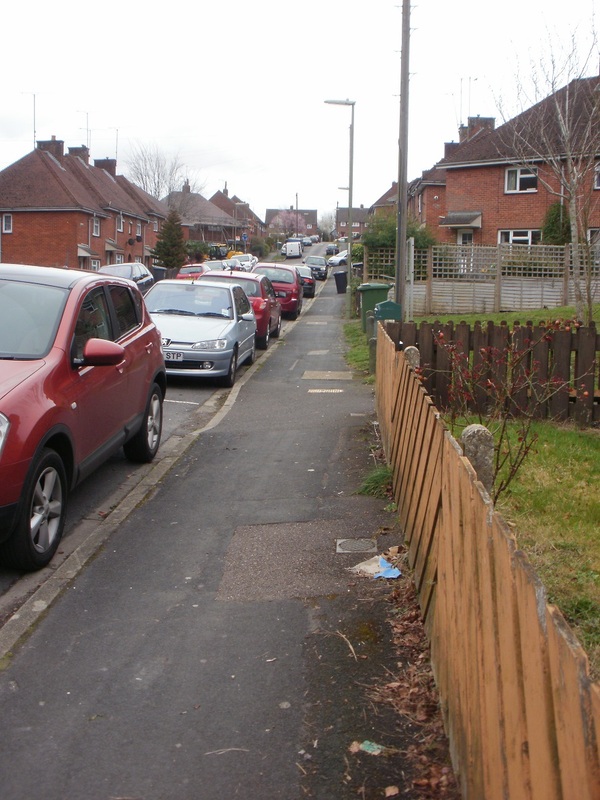 Two long distances footpaths at the same time! 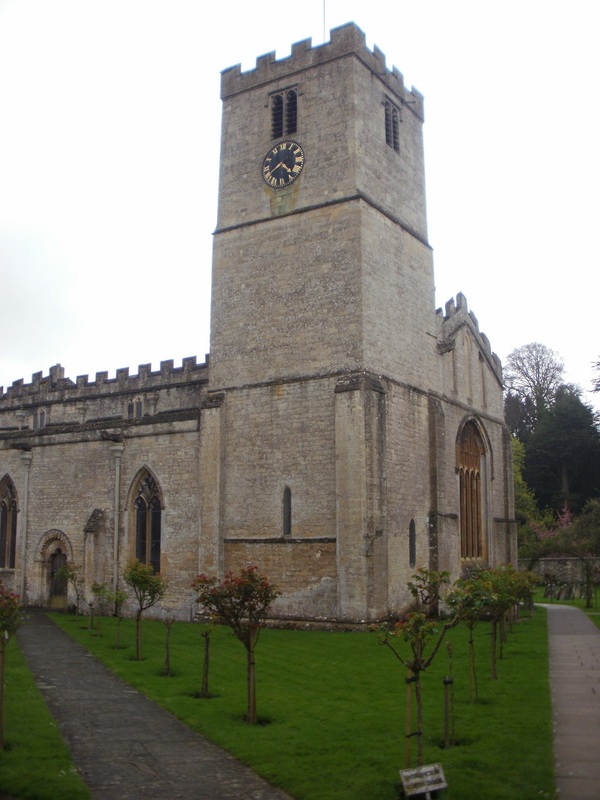 Down Hatherley Church (St Mary and Corpus Christi) was the location for a fairly straightforward multi. 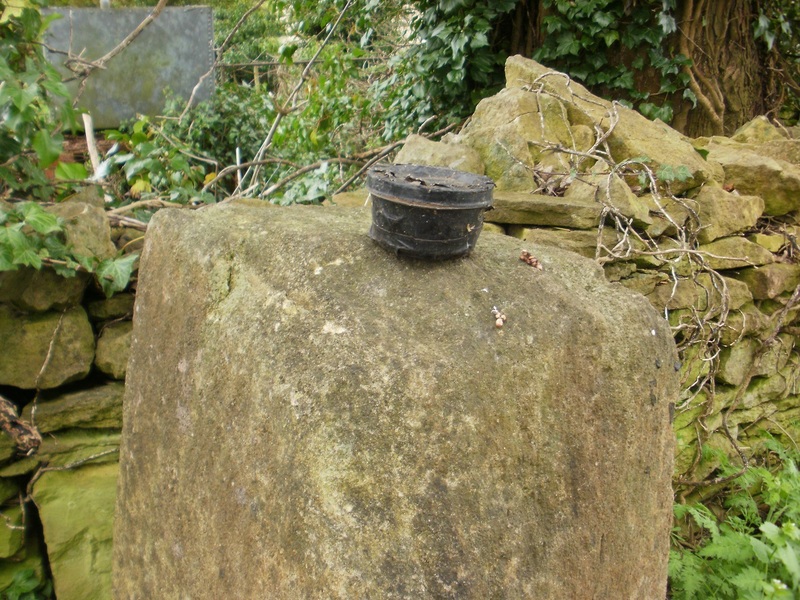 Find two gravestones, extract a date or two, perform a simple calculation and find the cache. Most previous finders had mentioned that the co-ordinates were 30 feet out, so we went to the calculated co-ordinate site and split up. 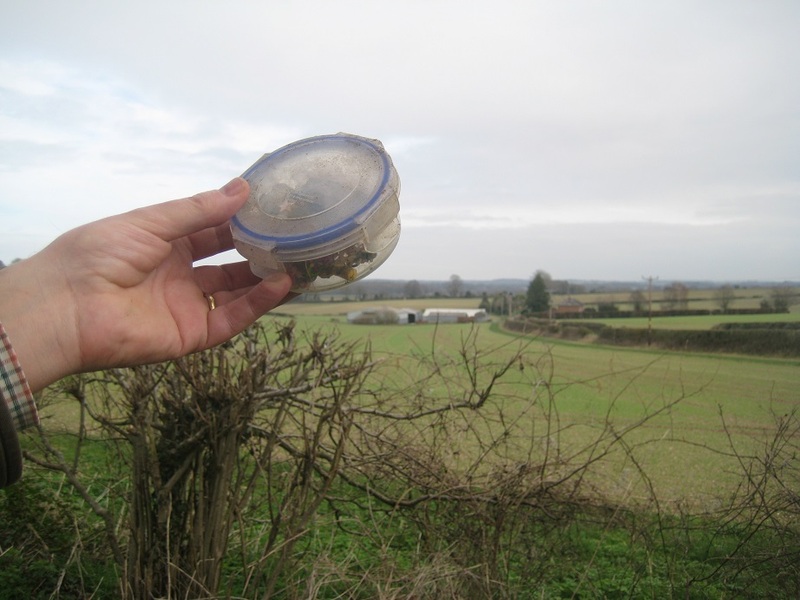 Mr Hg137 set off towards a distant tree, but Mrs Hg137 found the cache with the help of some nearby sheep! We know where the cache is! 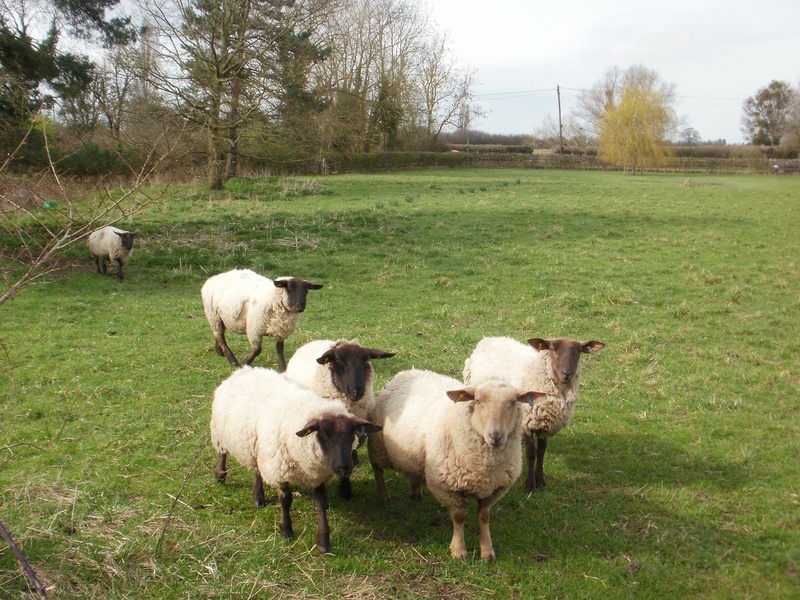 Don’t ewe? 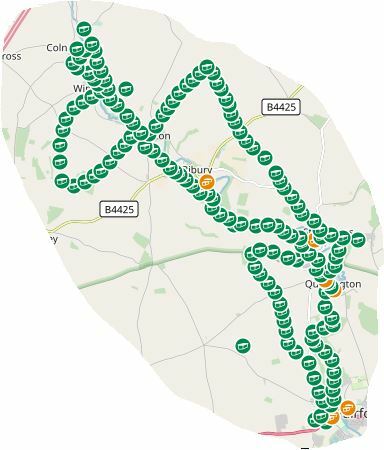 So we completed the first 4 miles of our ‘journey home’, found 4 caches as well as innumerable flooded fields. Fingers crossed it gets drier!